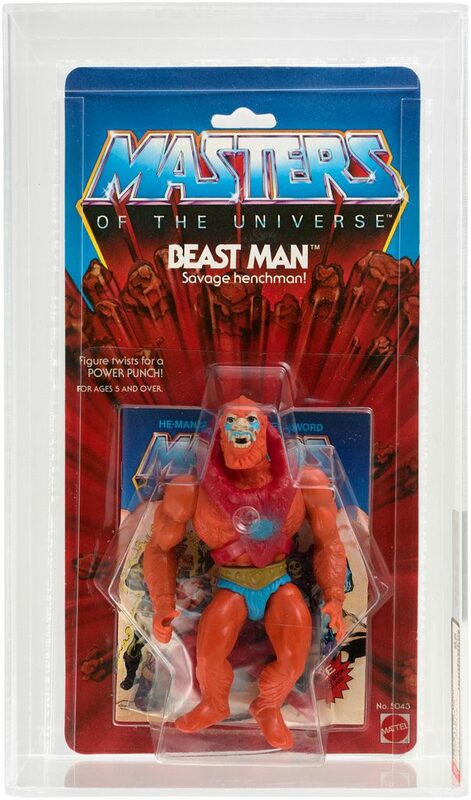 One of the great evil underlings of 1980s children’s entertainment, Beast Man was among the first four Masters of the Universe figures released in 1982. 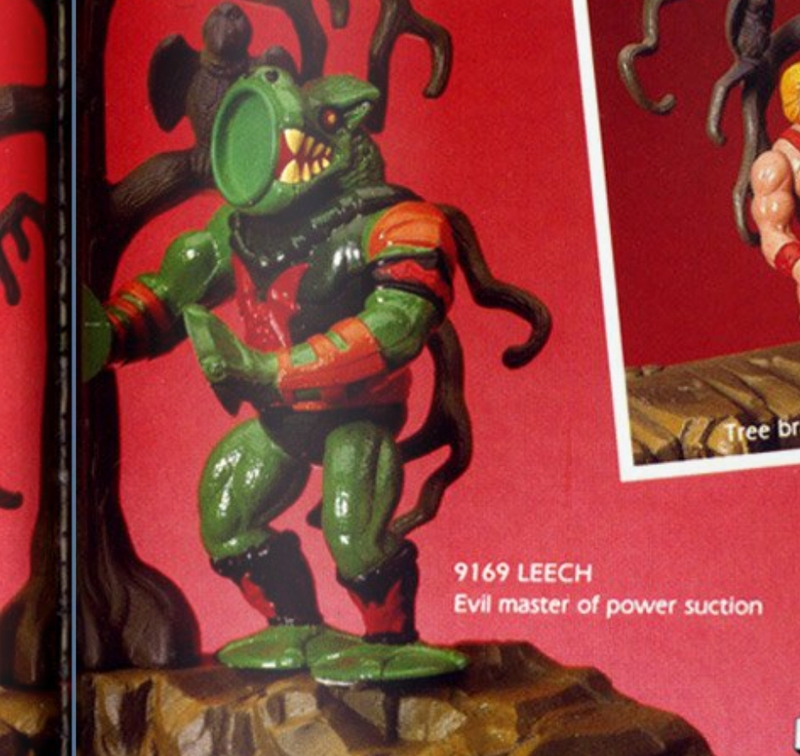 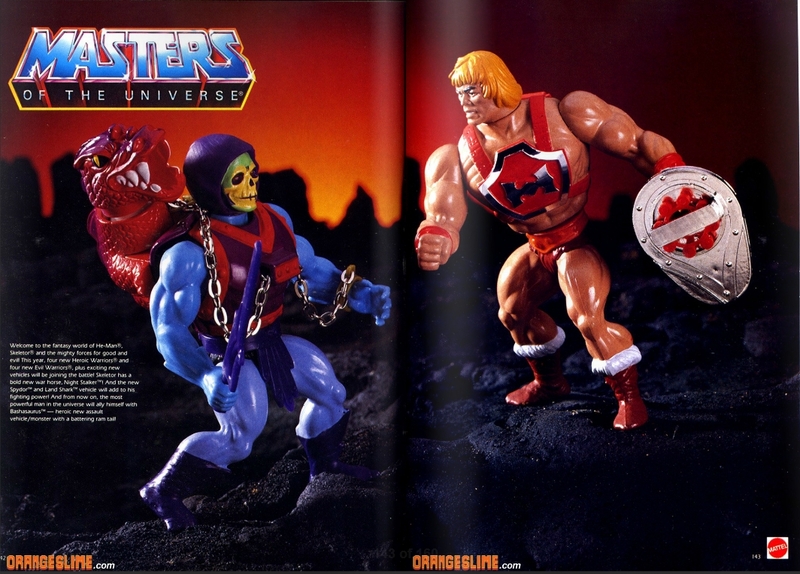 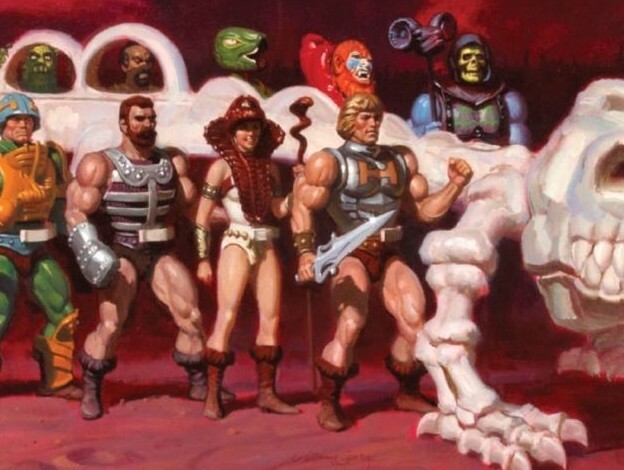 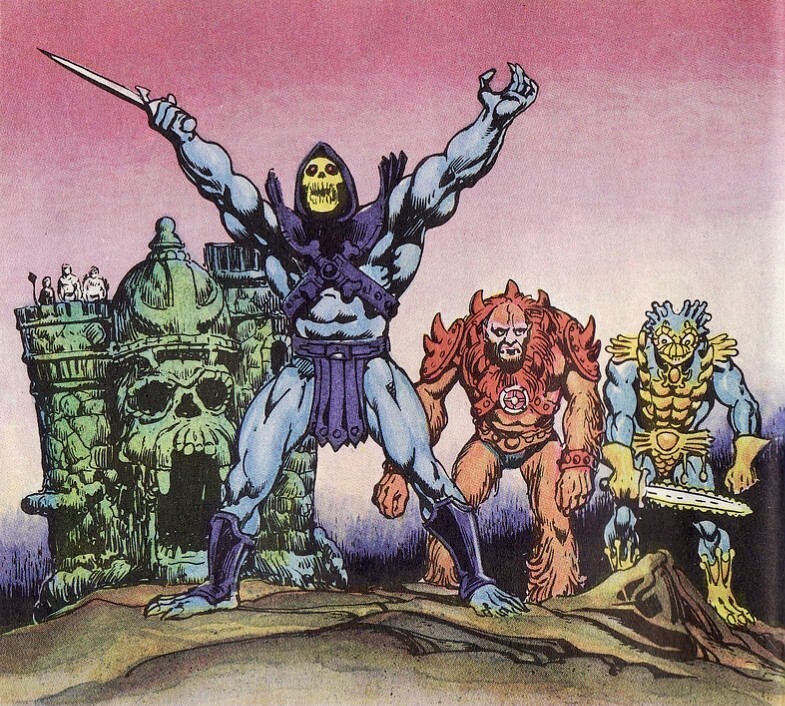 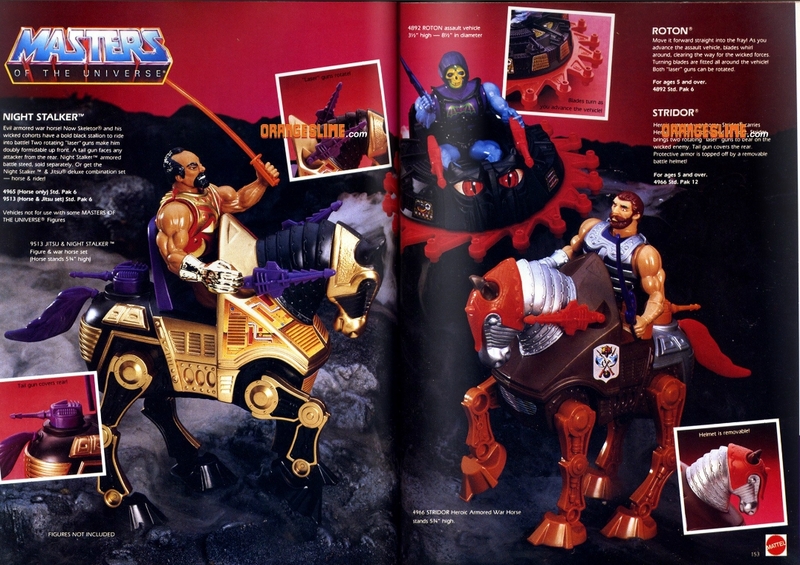 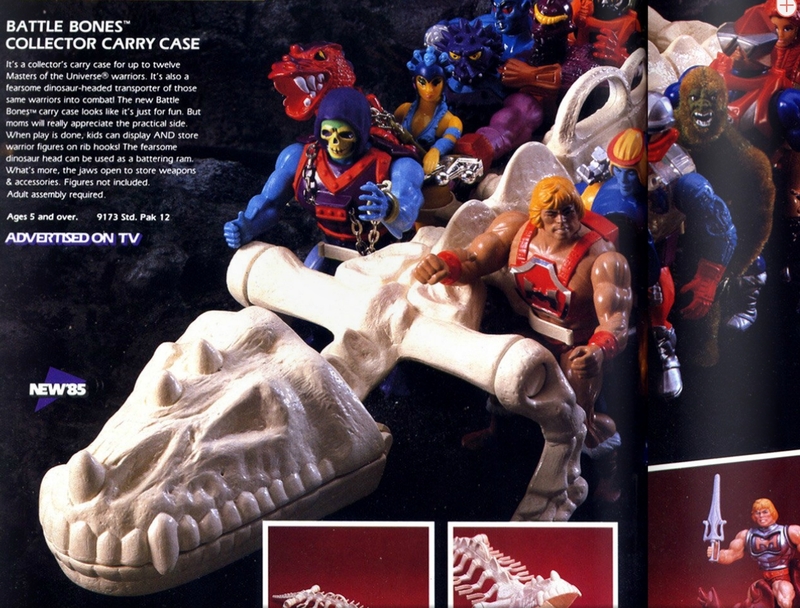 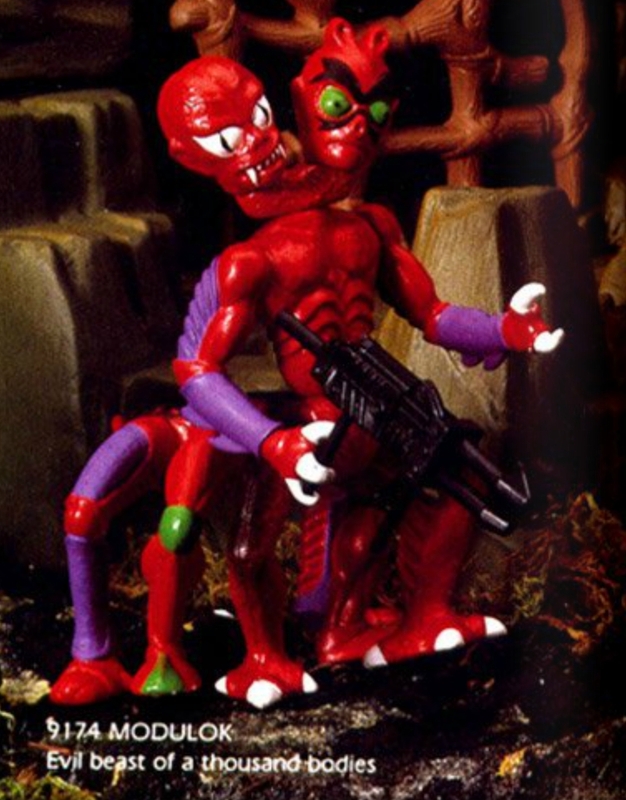 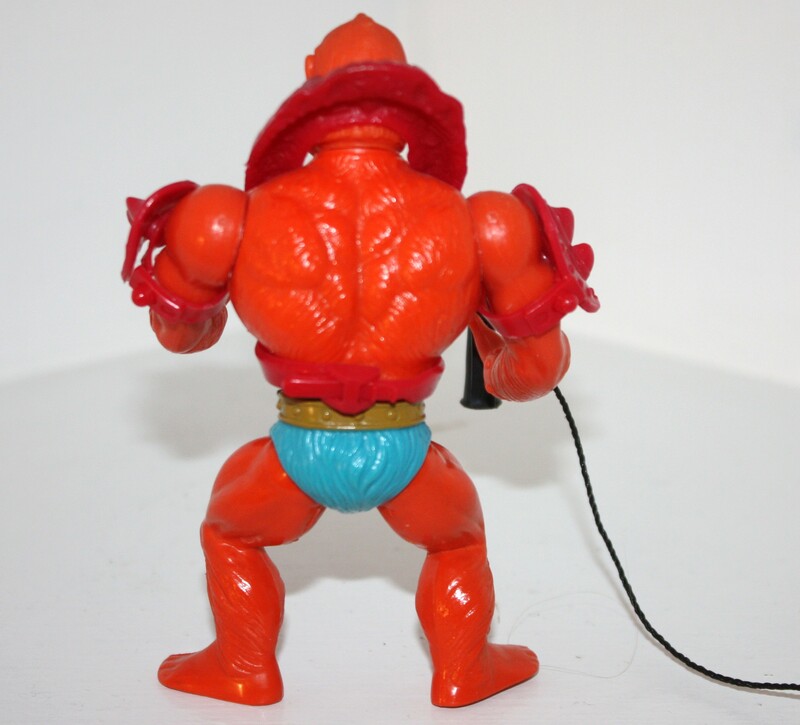 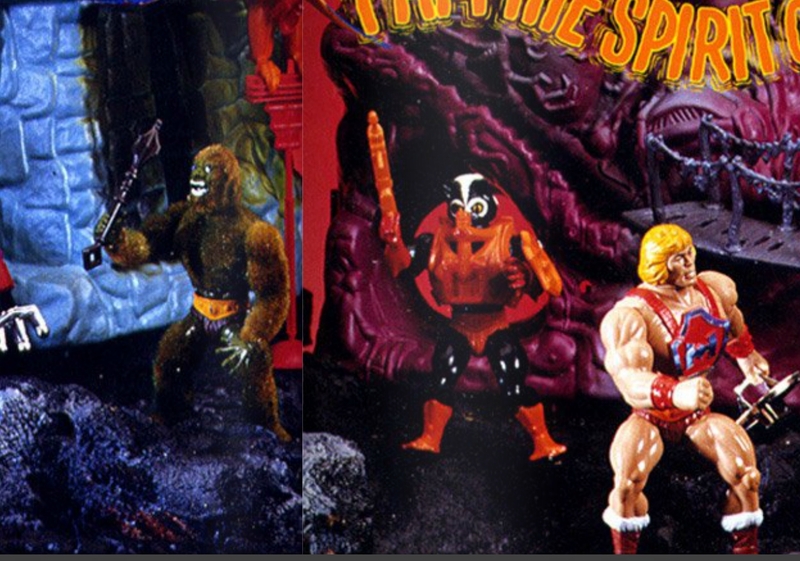 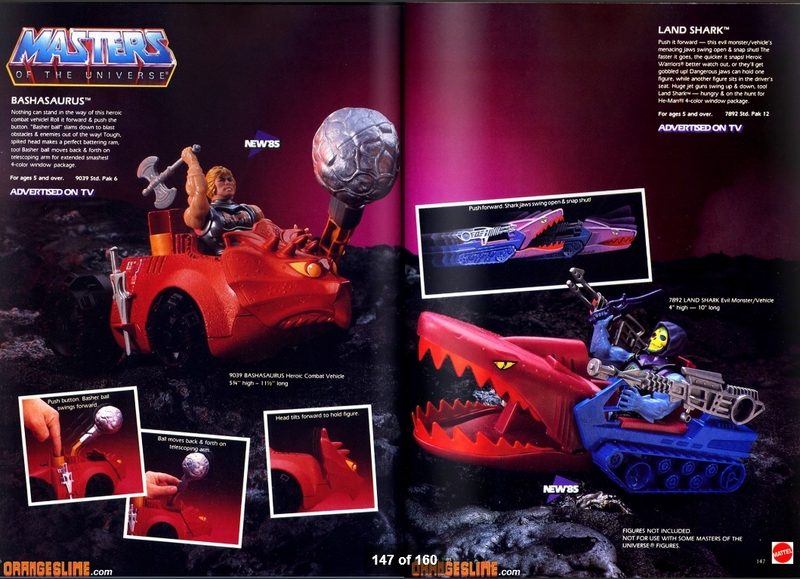 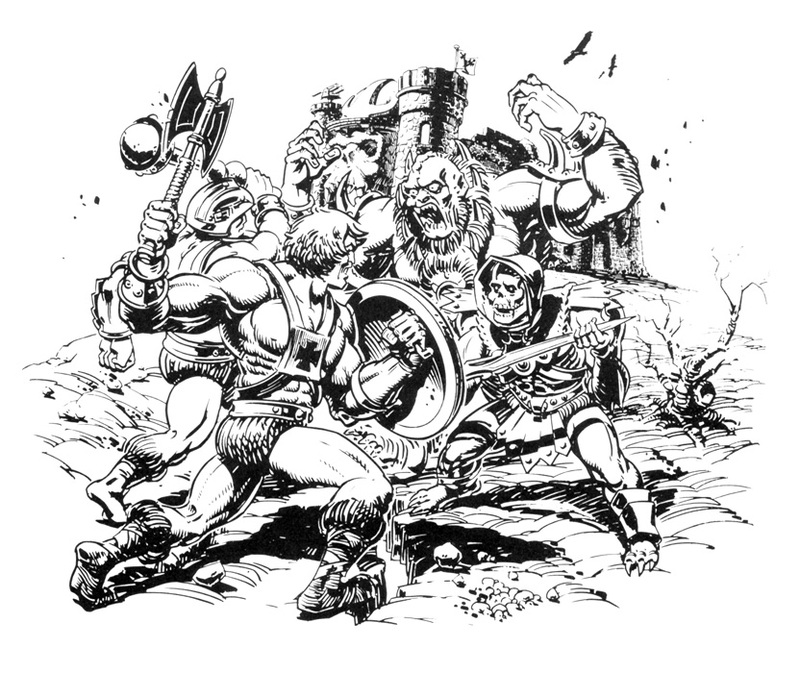 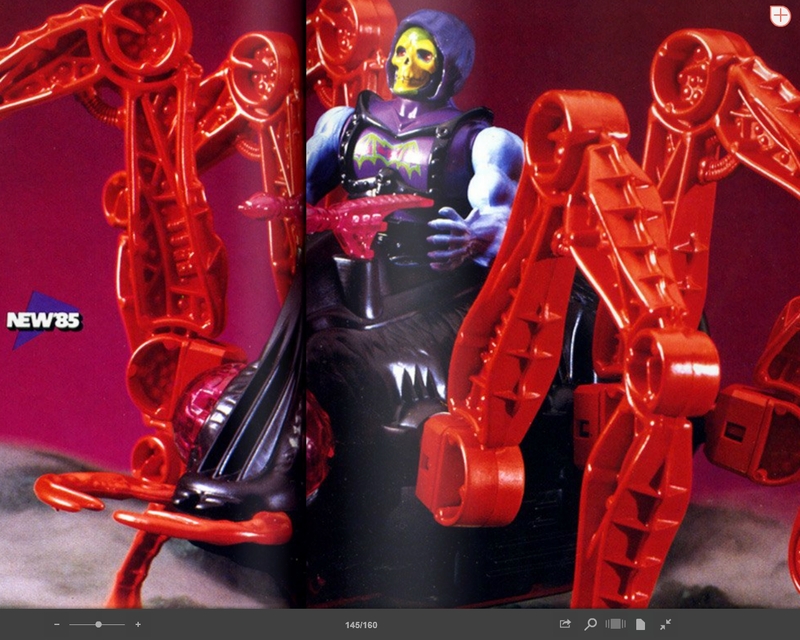 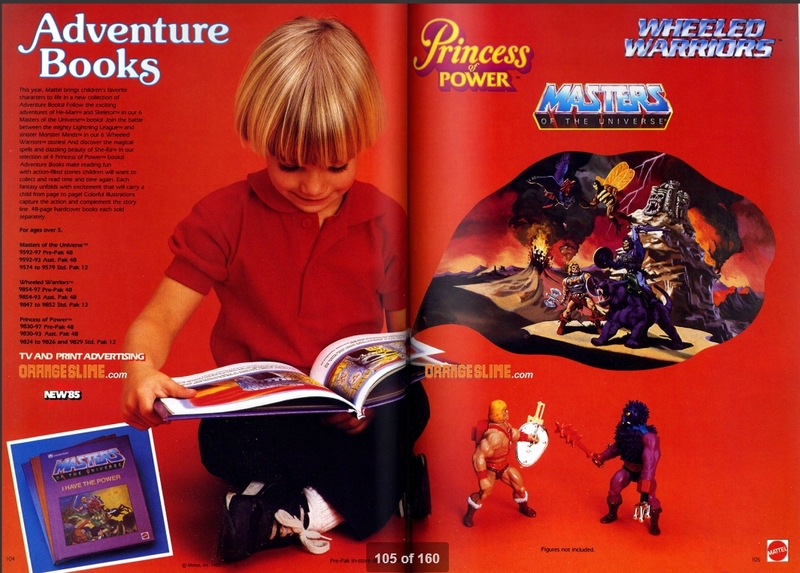 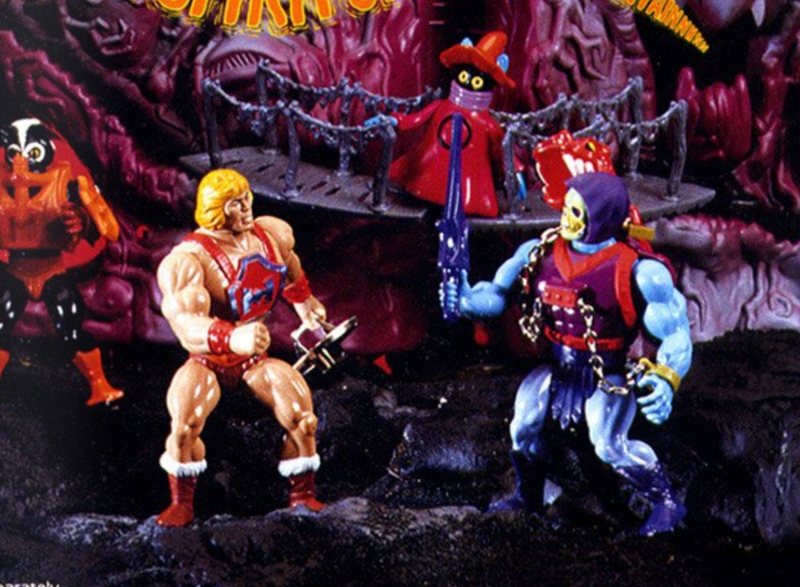 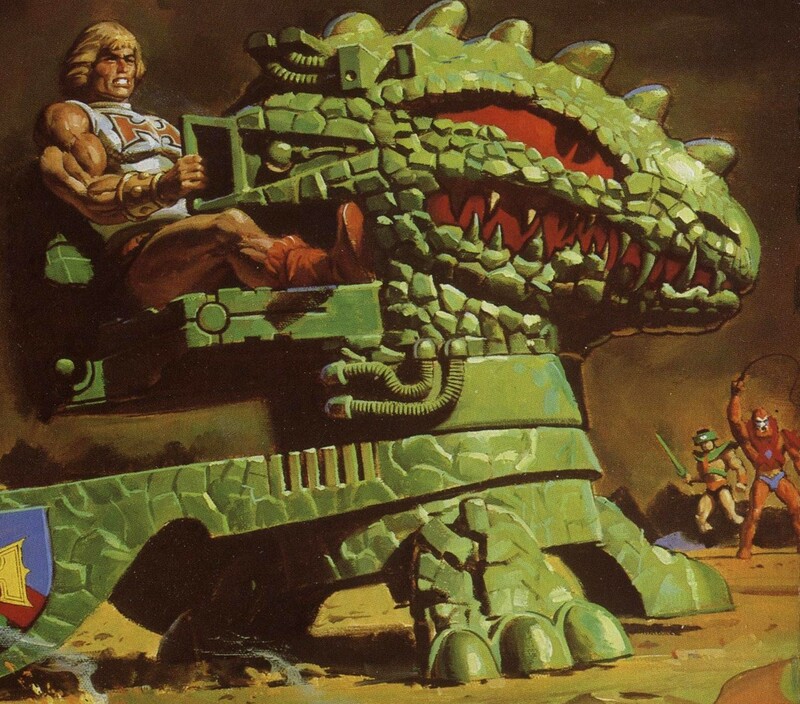 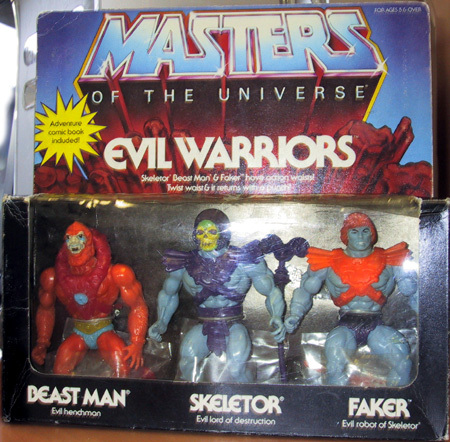 When the Masters of the Universe line was under development in 1980 and 1981, some effort was made to reuse sculpts from previous Mattel toy lines, such as Big Jim and Tarzan. 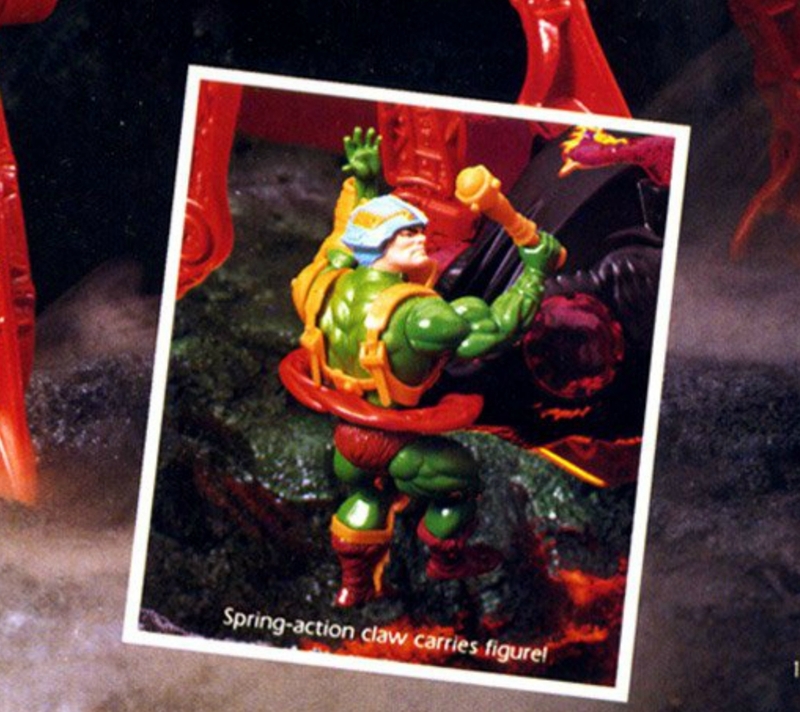 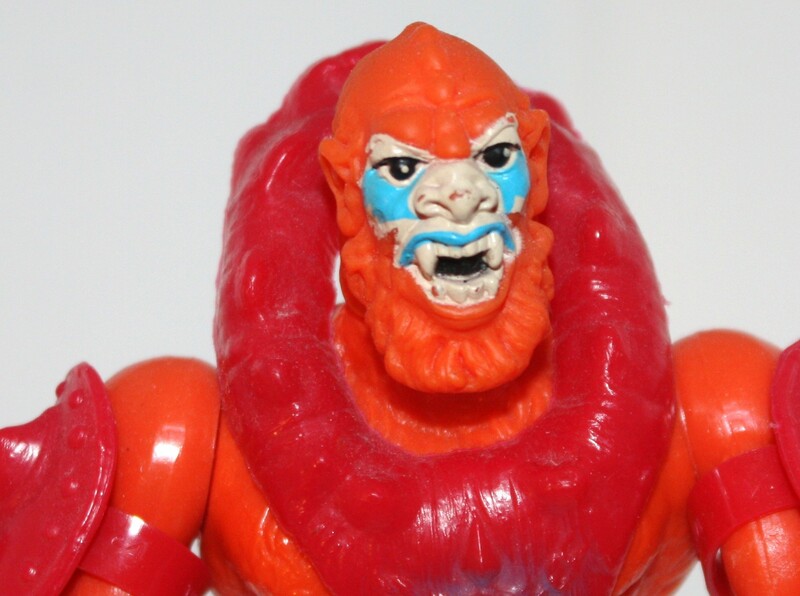 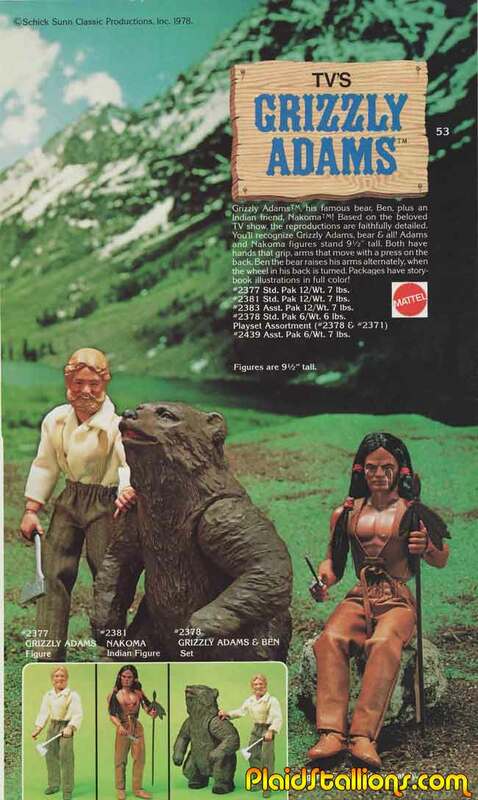 Mattel artist Mark Taylor first conceived of Beast Man as a savage bear creature, possibly intending it to reuse the Grizzly Adams “Ben” bear mold. 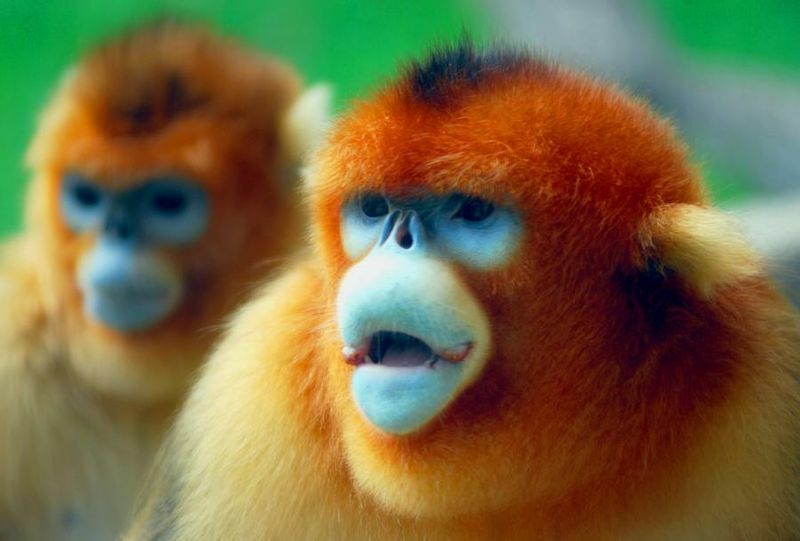 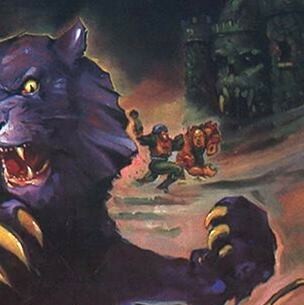 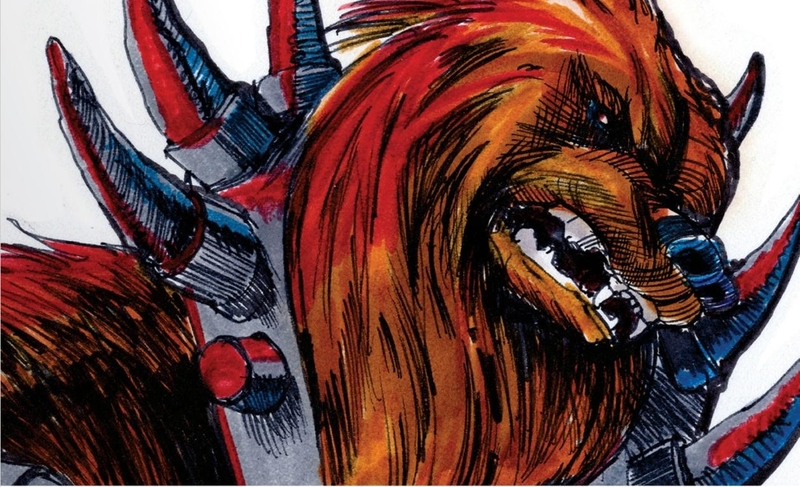 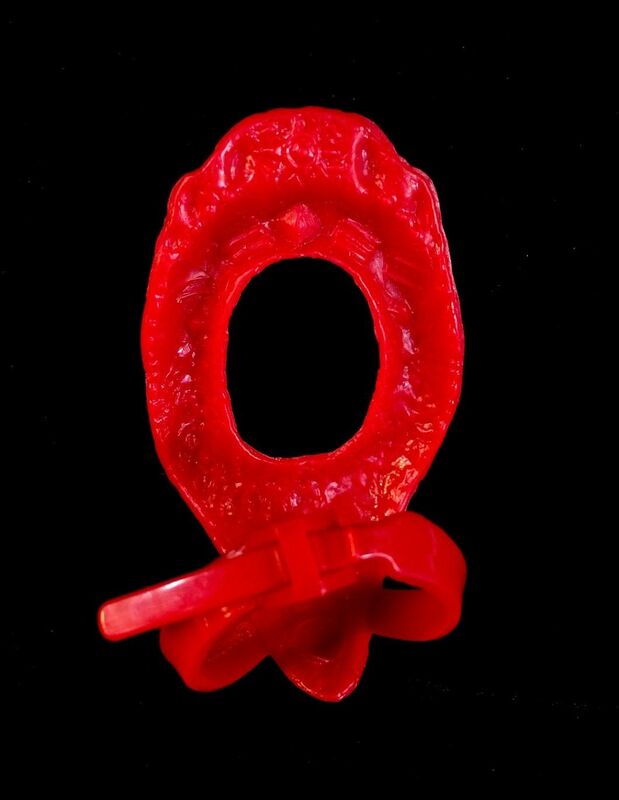 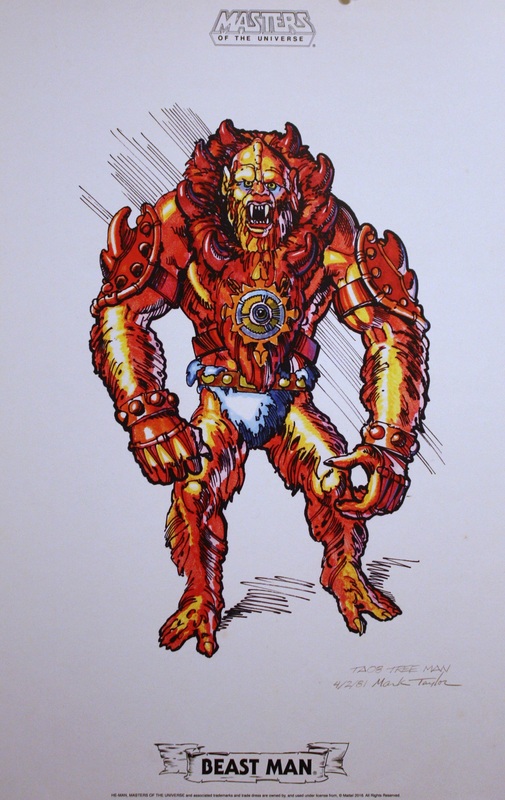 This creature, known to fans now as Red Beast, was brightly colored and fierce looking. 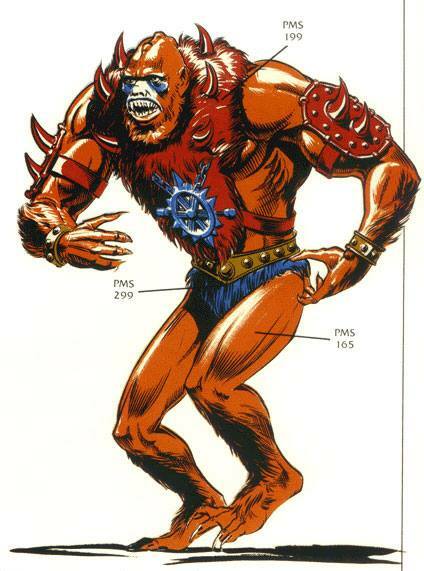 Although he bears little to resemblance to Beast Man as we know him, the spiked armor around his neck, the wrist gauntlets and the metal claws would all find their way onto the final design. 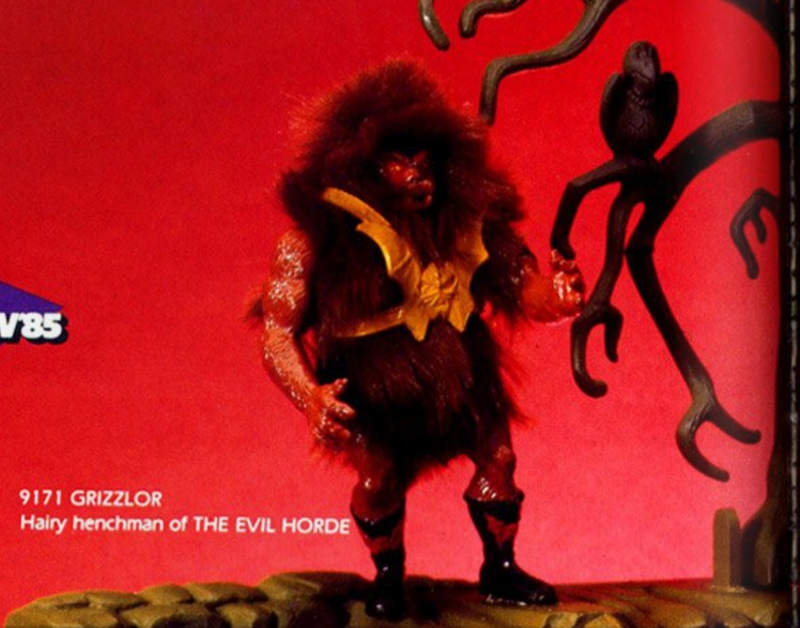 The idea of producing a bear creature was dropped because Mattel executives didn’t want to make something too close to Chewbacca (although it’s hard to see much resemblance between the two, beyond the shaggy fur). 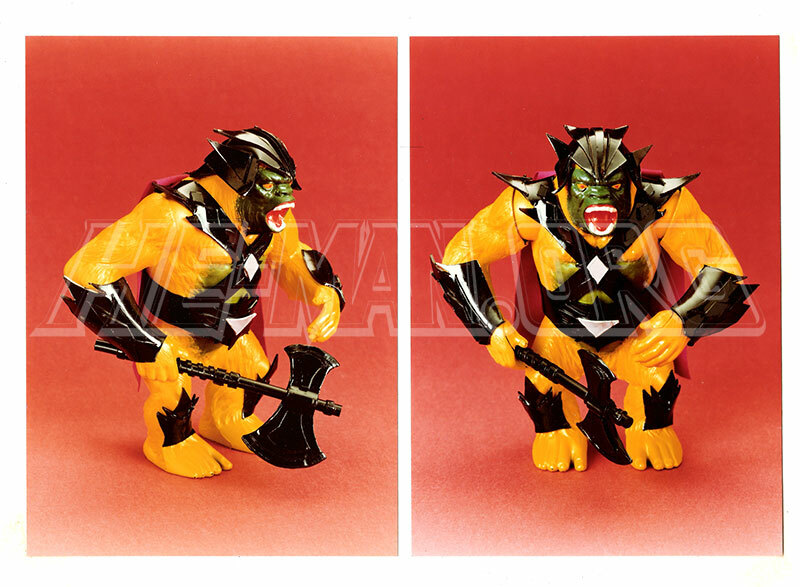 I changed the ape’s body color from black to bright yellow and gave him a dark olive-green face and chest.His face in contorted with white teeth snarling in an open mouth of blood red. 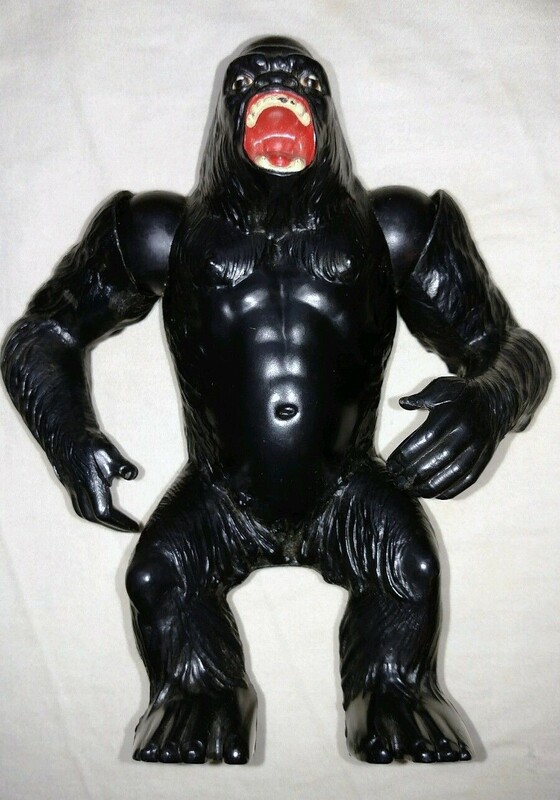 I gave him a black body harness. 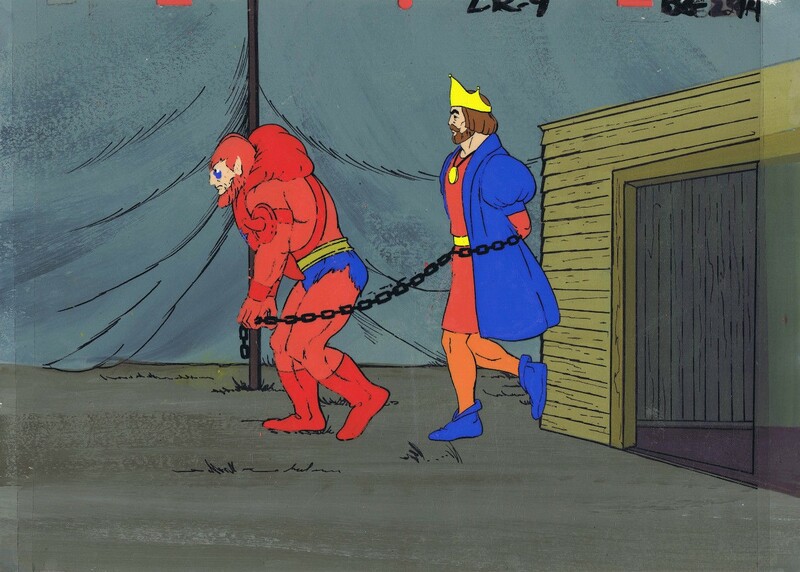 From his shoulders I hung a dark maroon cape. 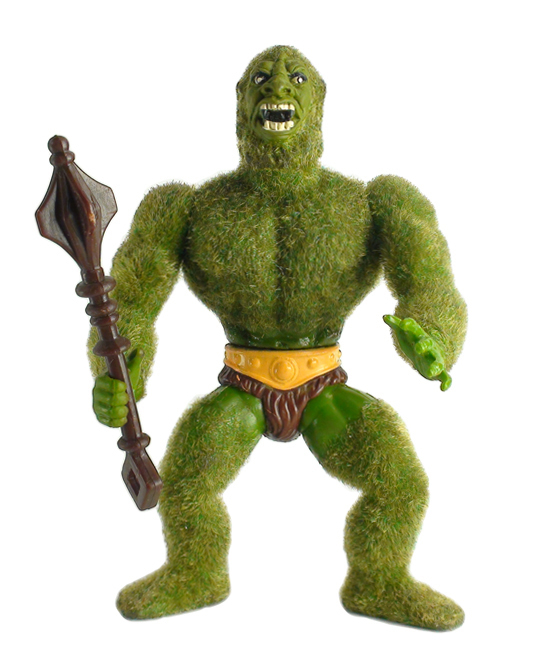 When I showed “Gygor” to marketing Mark Ellis said that is [expletive] great!!! 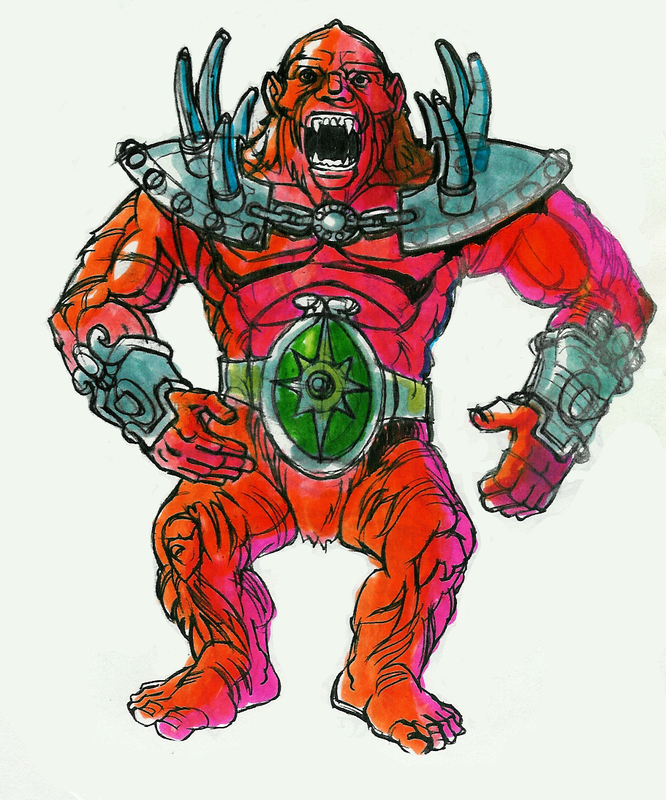 Ted Mayer in my design group created a striking full-color illustration of the beast, with He-Man mounted on his back. 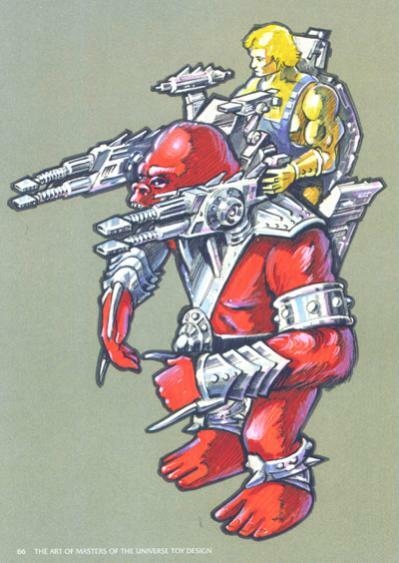 Gygor was decked out with a panoply of harnesses and weapons. 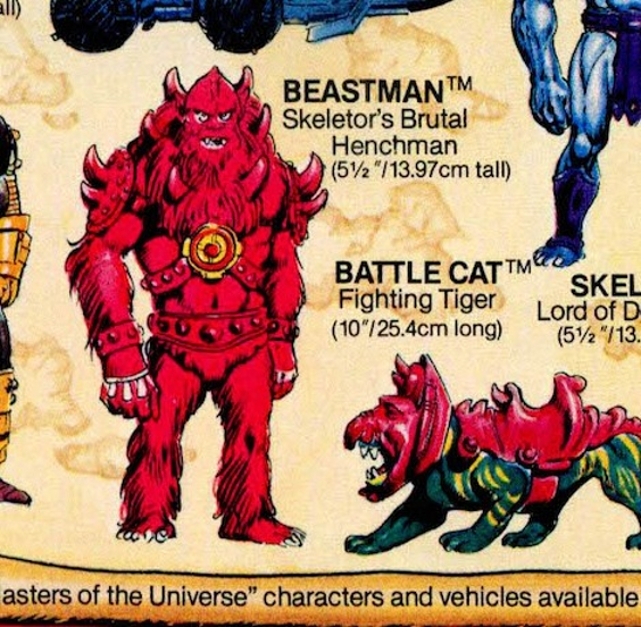 Mark Taylor, on the other hand, used the Big Jim Gorilla buck to further refine his own Beast Man concept (keeping in mind that the name Beast Man is not attached to any of these images). 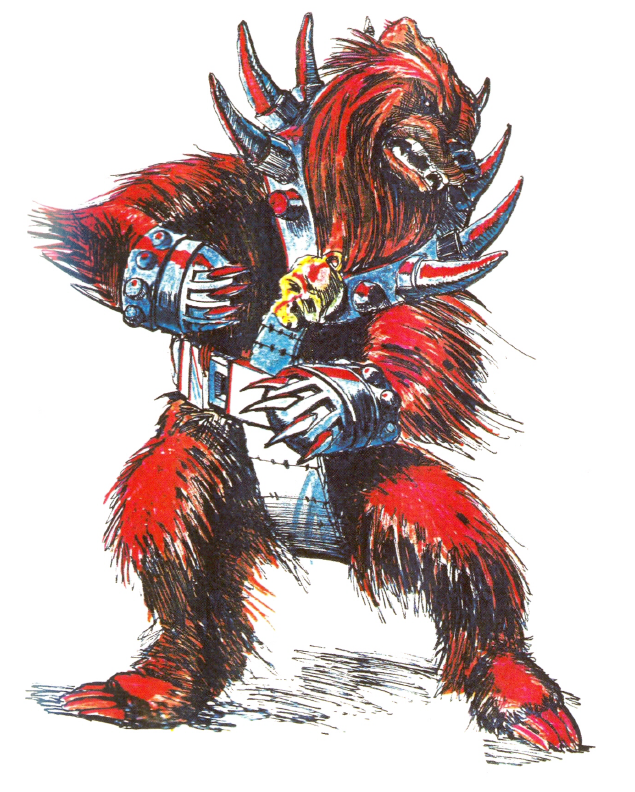 In this version the spiked armor around the neck from Red Beast is retained in modified form, but the spiked weapons on the hands were removed. 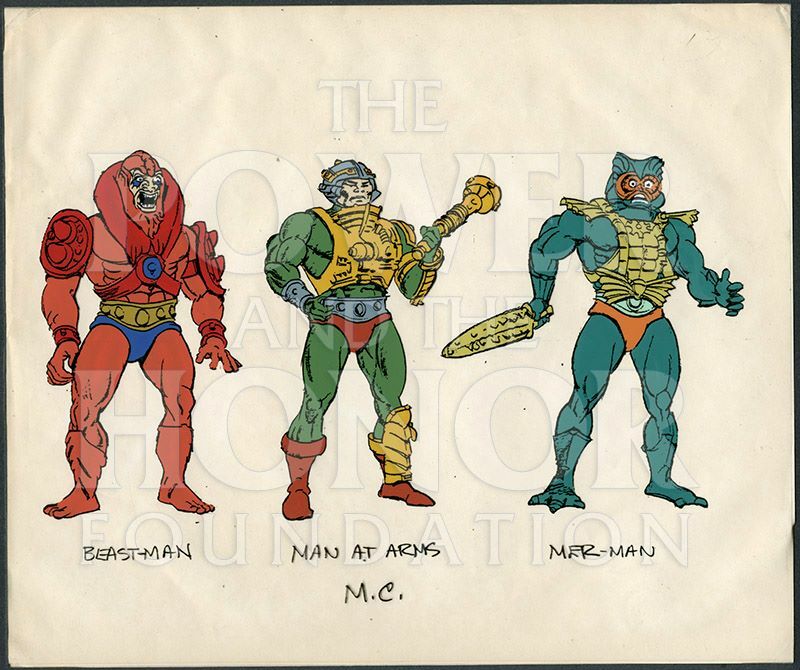 The wrist gauntlets actually recall earlier Mark Taylor concept drawings for He-Man. 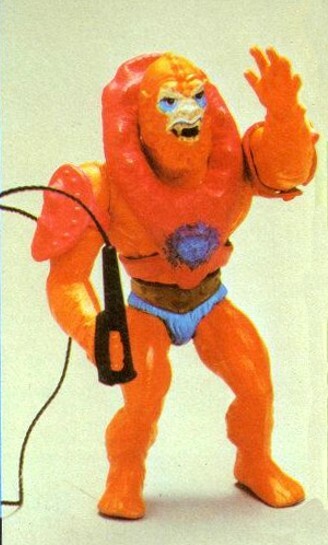 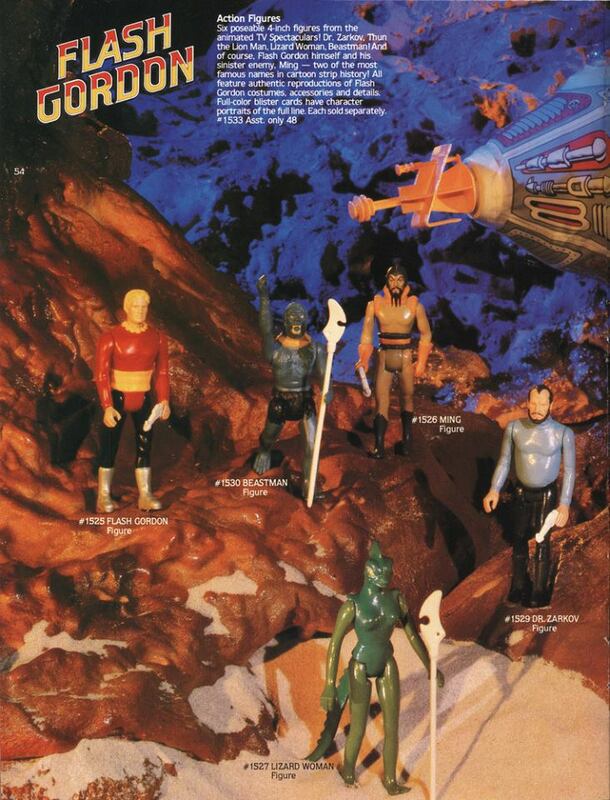 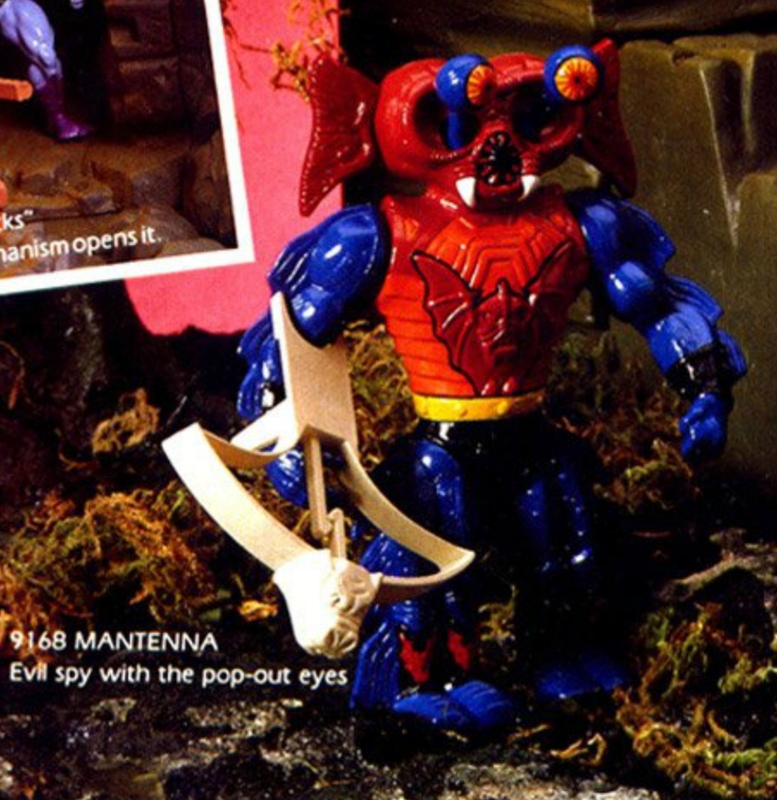 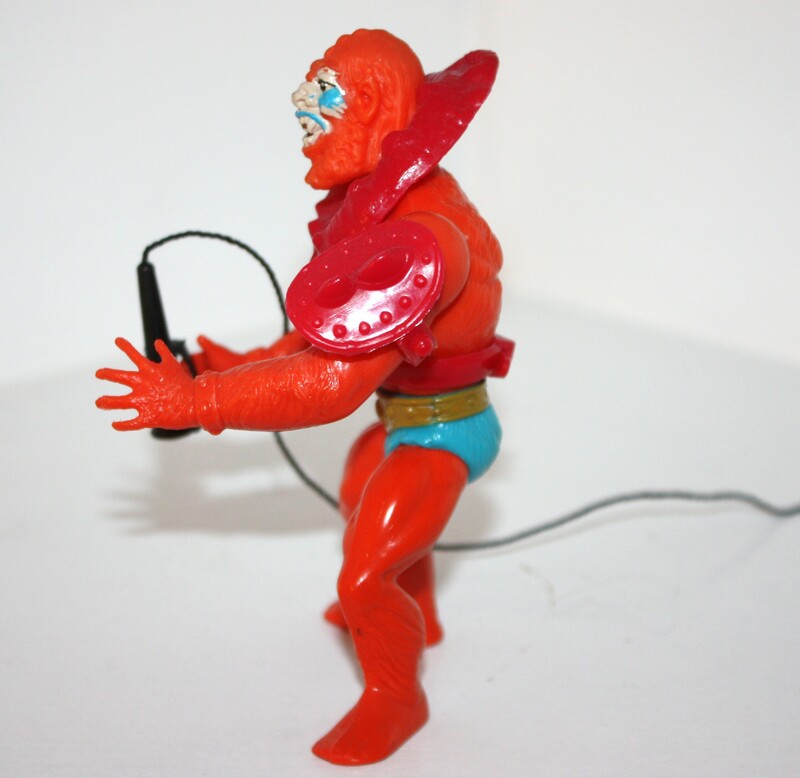 Finally, a belt was added to the character, which featured a compass-like design that would find its way onto the final Beast Man figure. 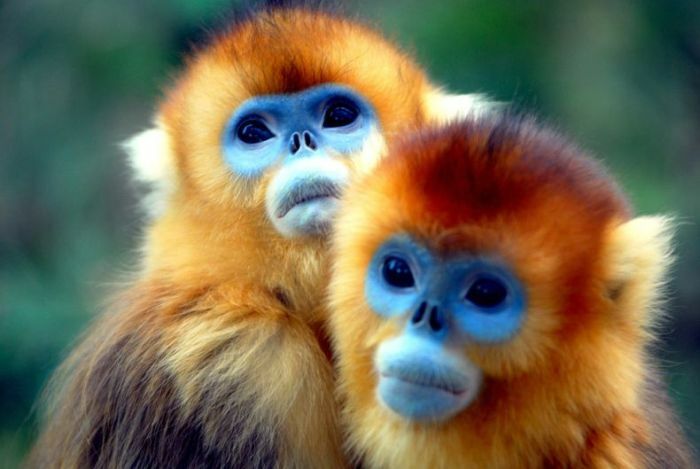 Image source: Rebecca Salari Taylor. 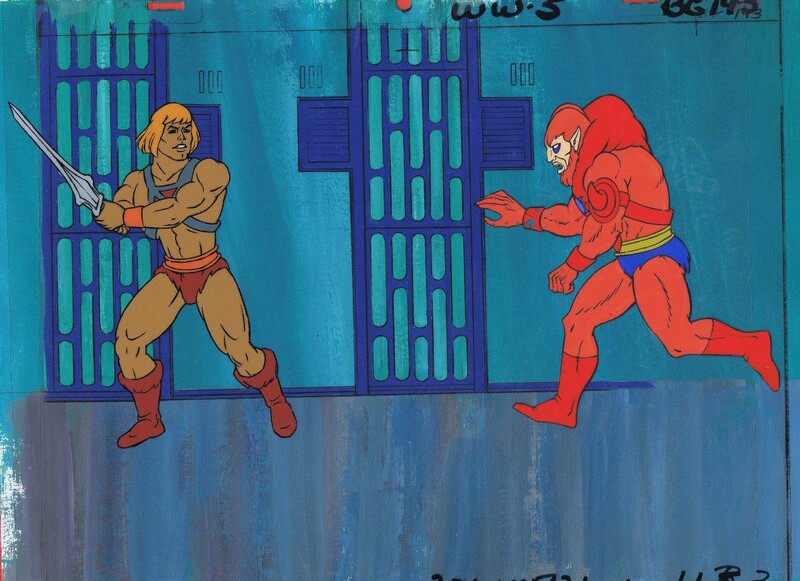 Artwork by Mark Taylor. 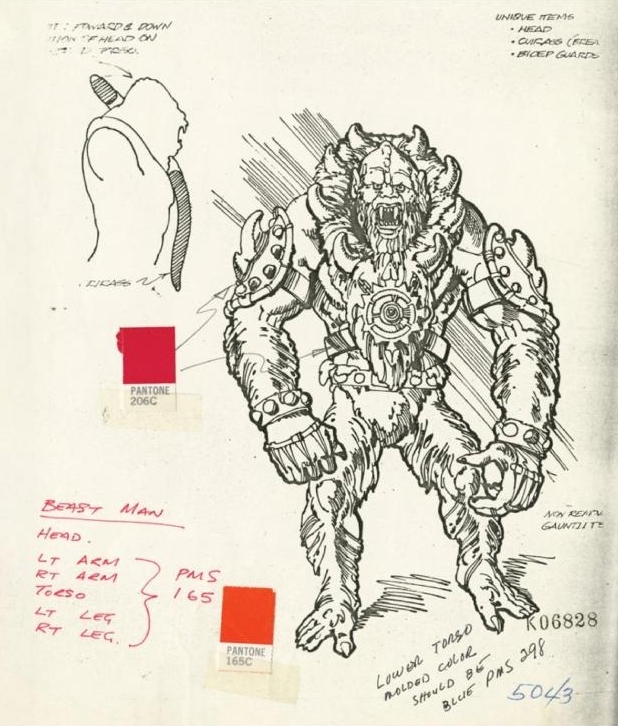 This general design was used to create what I believe is the first Beast Man prototype. 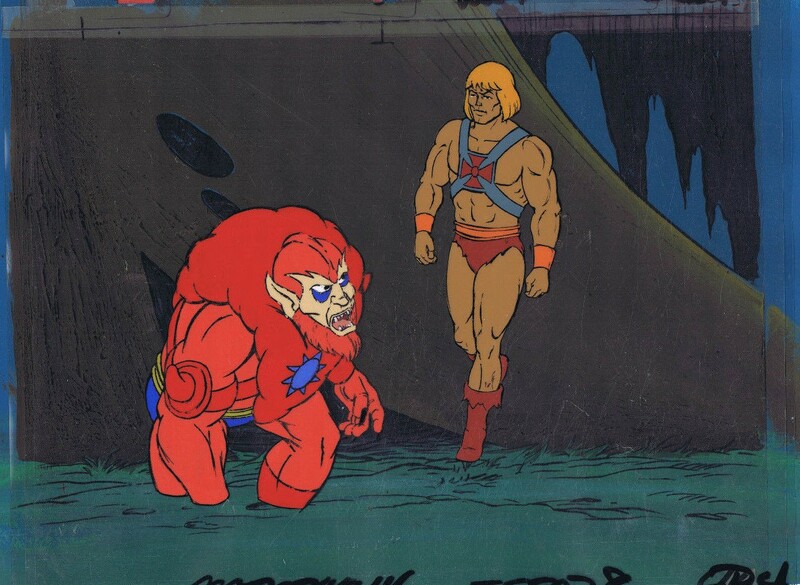 If it’s not the first, then it’s very early, indeed. 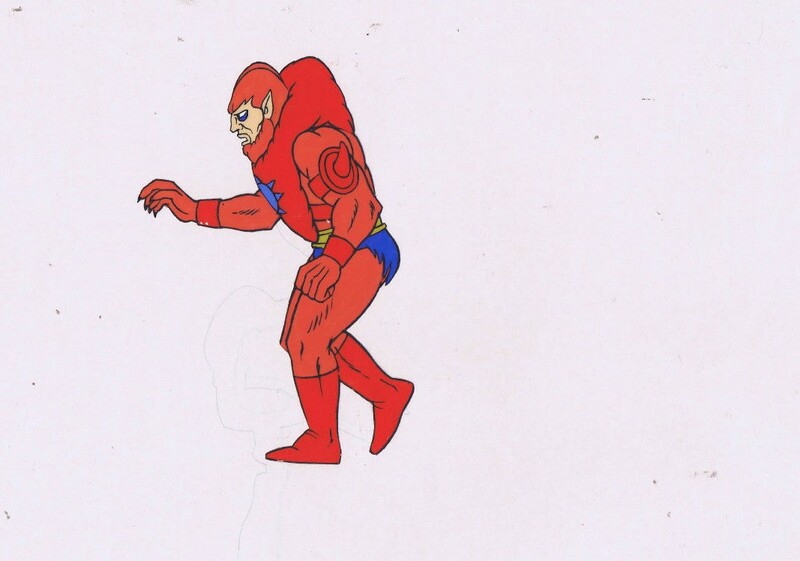 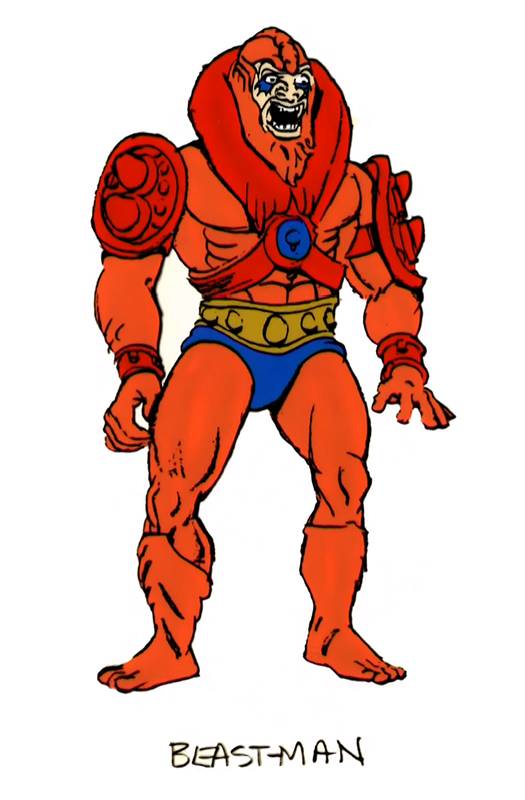 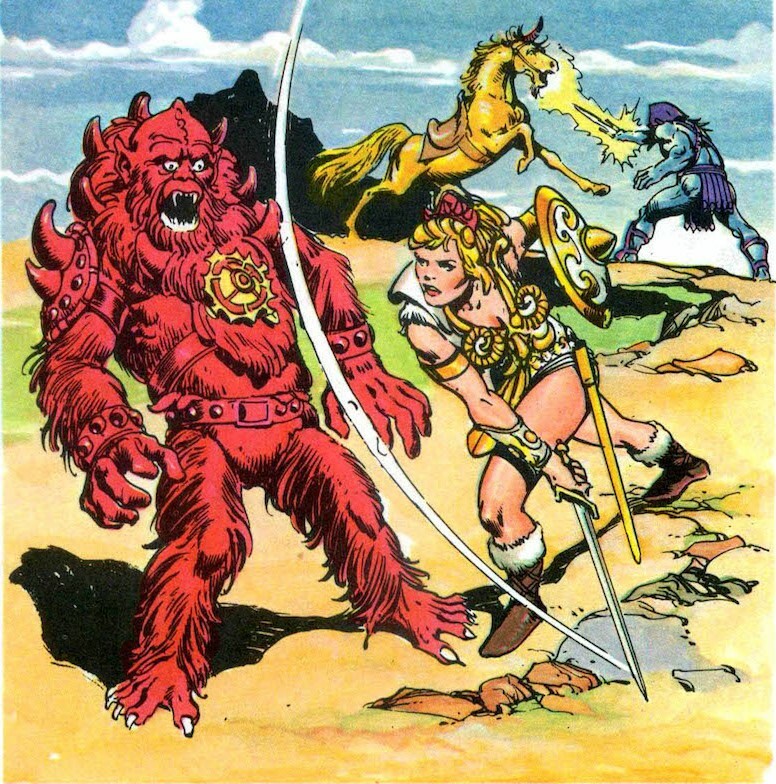 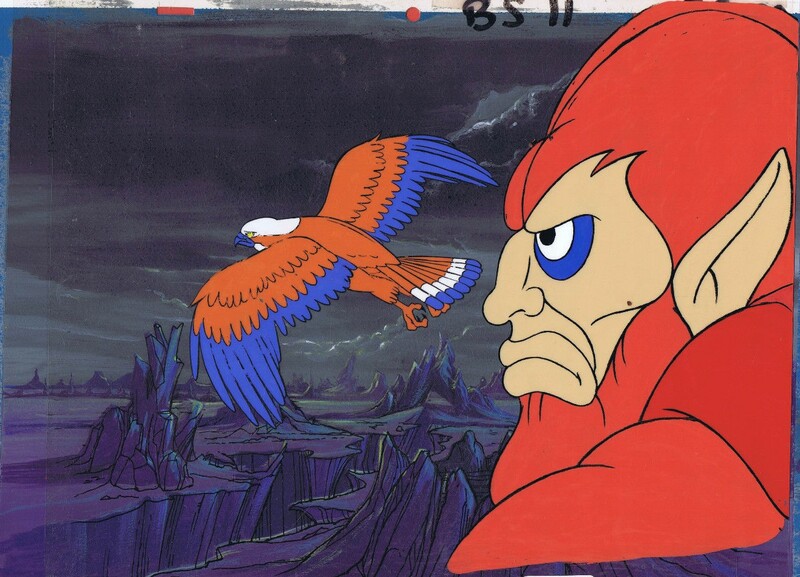 This Beast Man (below) follows the general shape of the red gorilla design above, but is colored with the familiar orange fur and red armor. 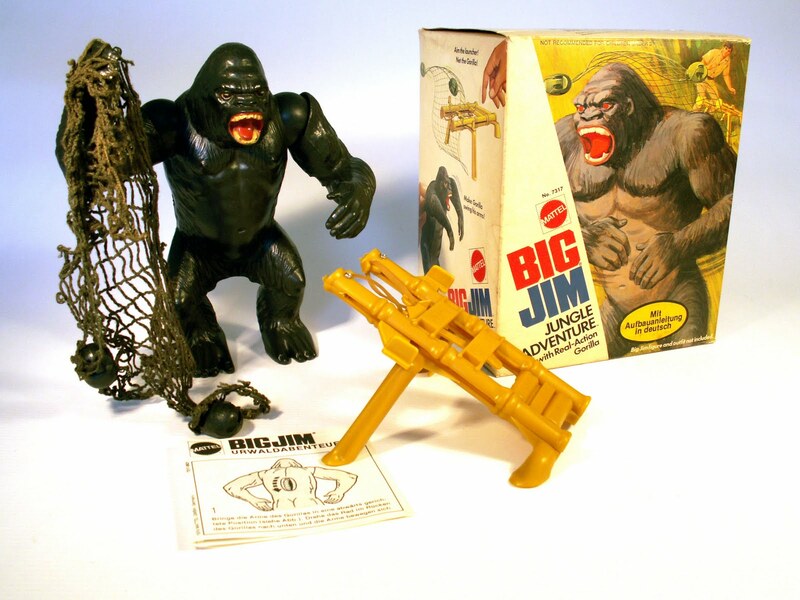 This is not, however, a repainted big Jim Gorilla, as it’s in scale with the other early prototype figures (the Big Jim gorilla is much larger). 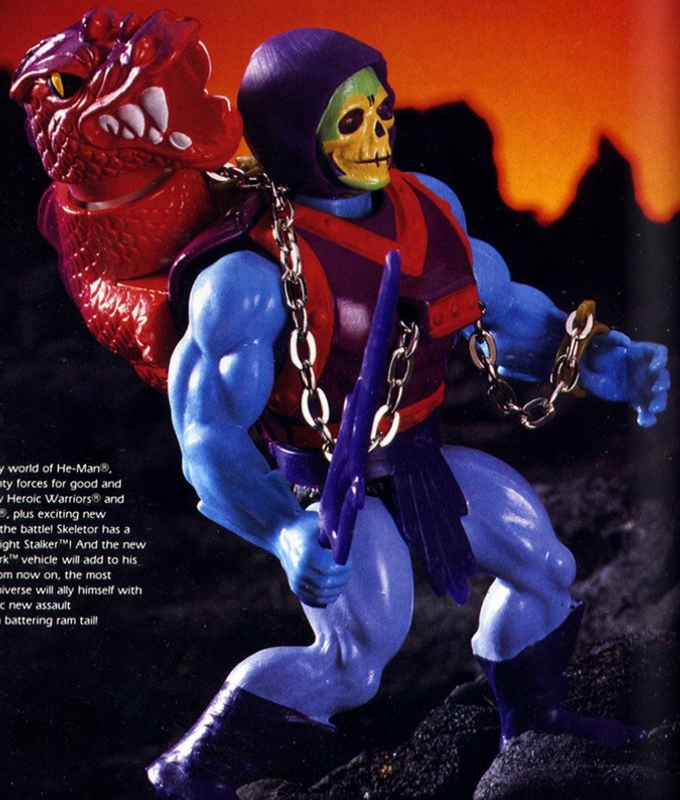 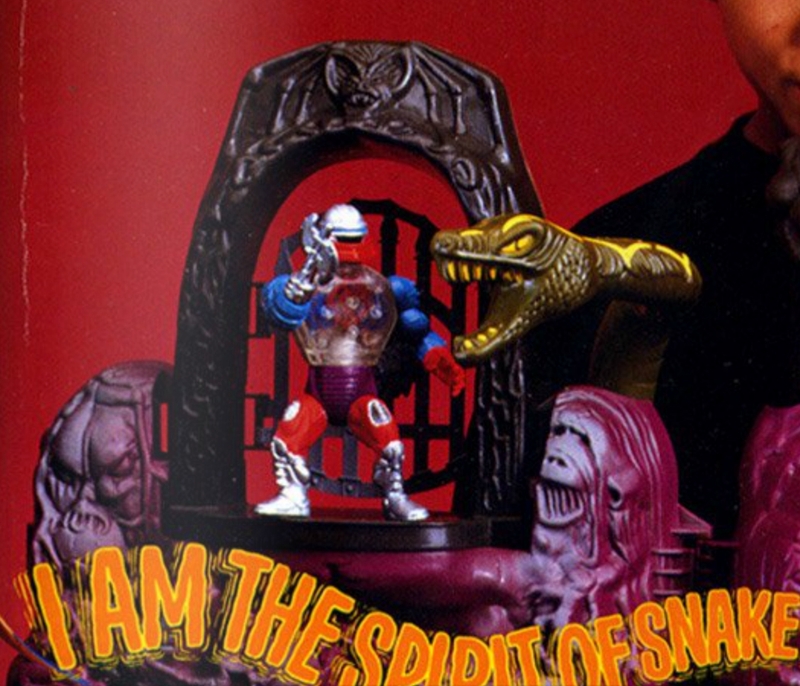 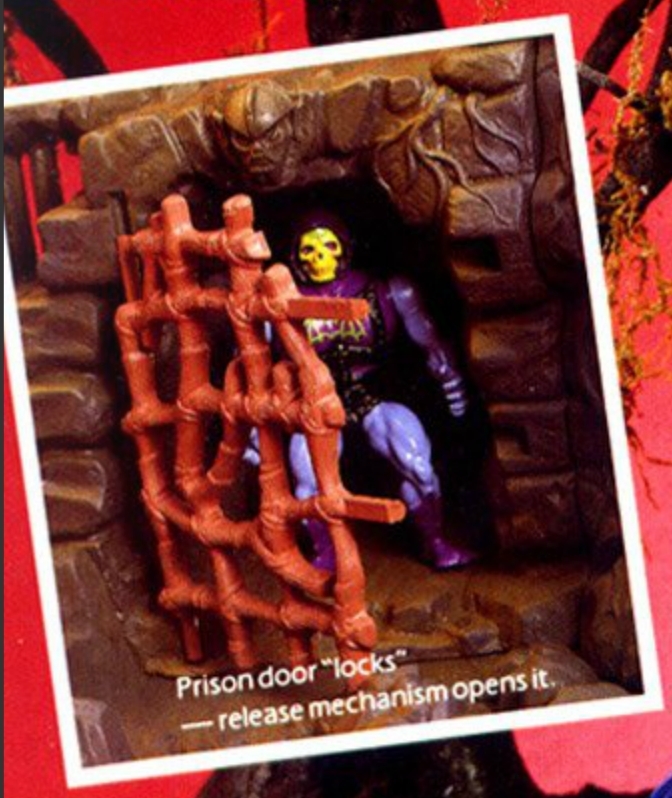 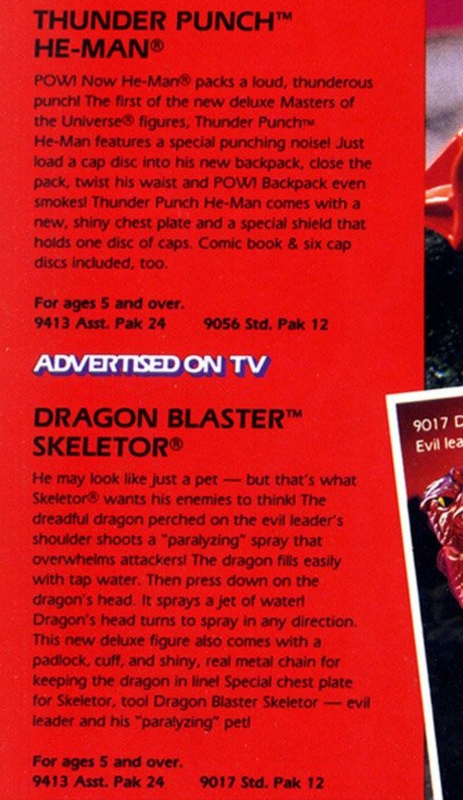 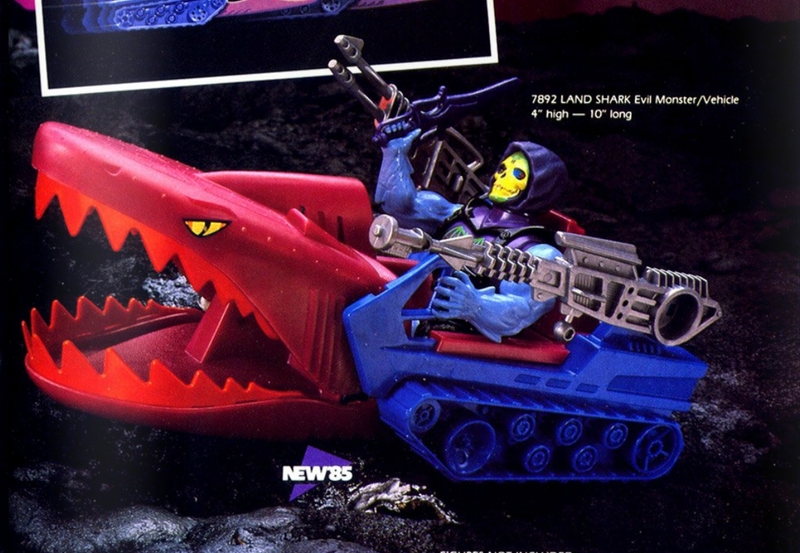 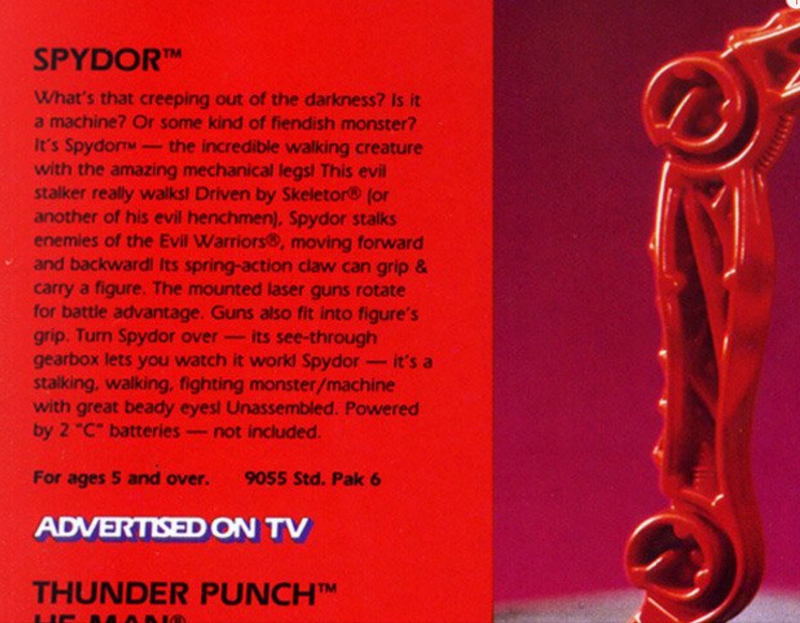 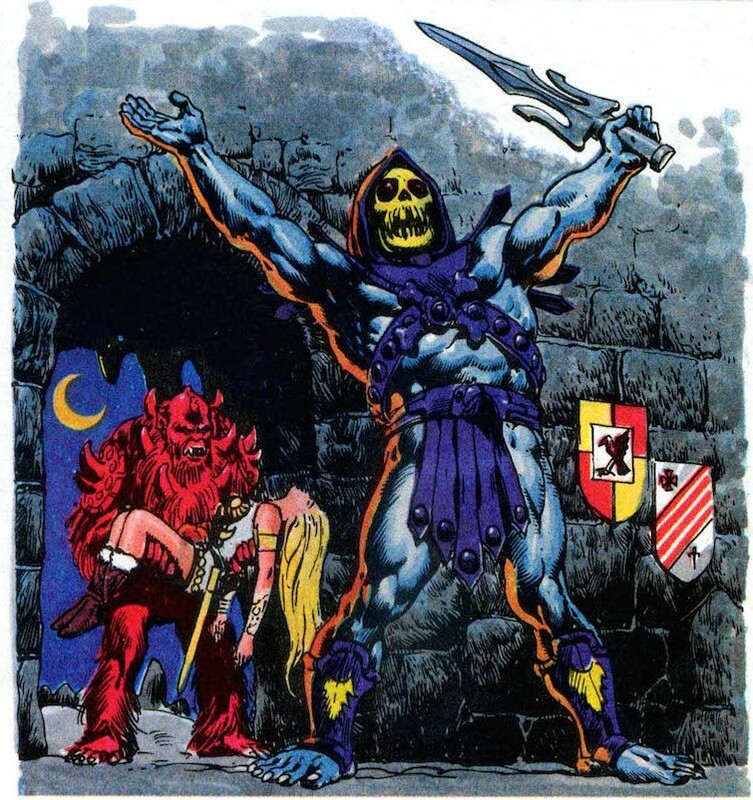 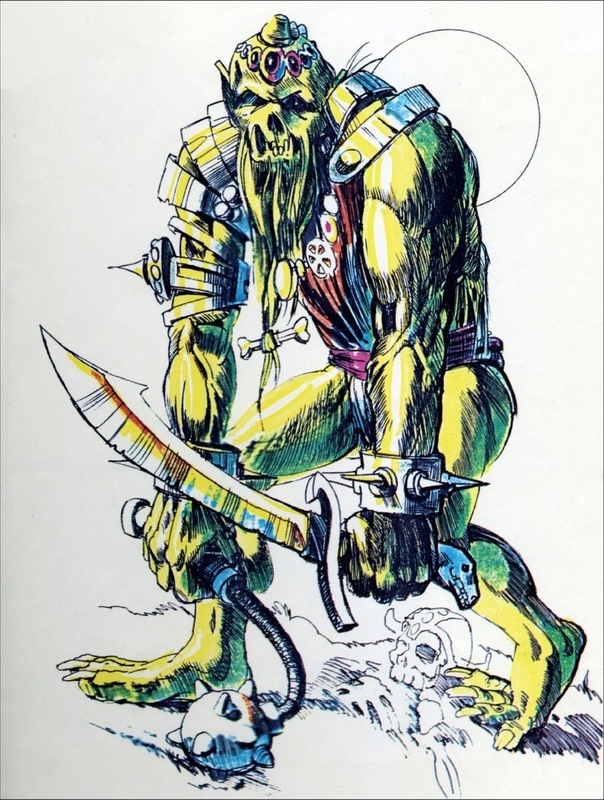 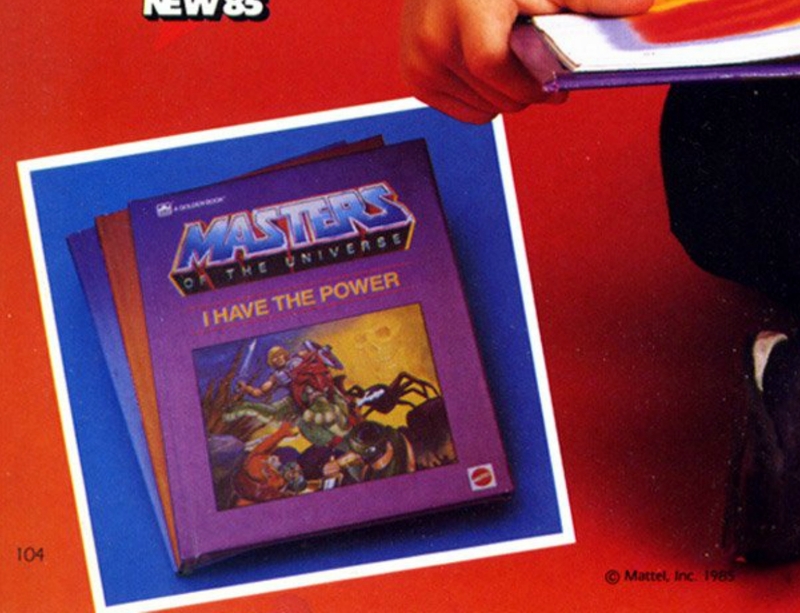 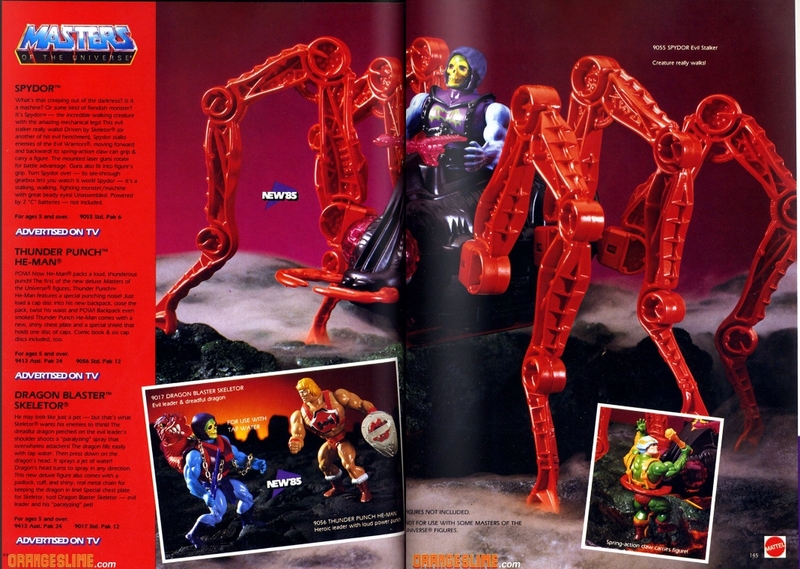 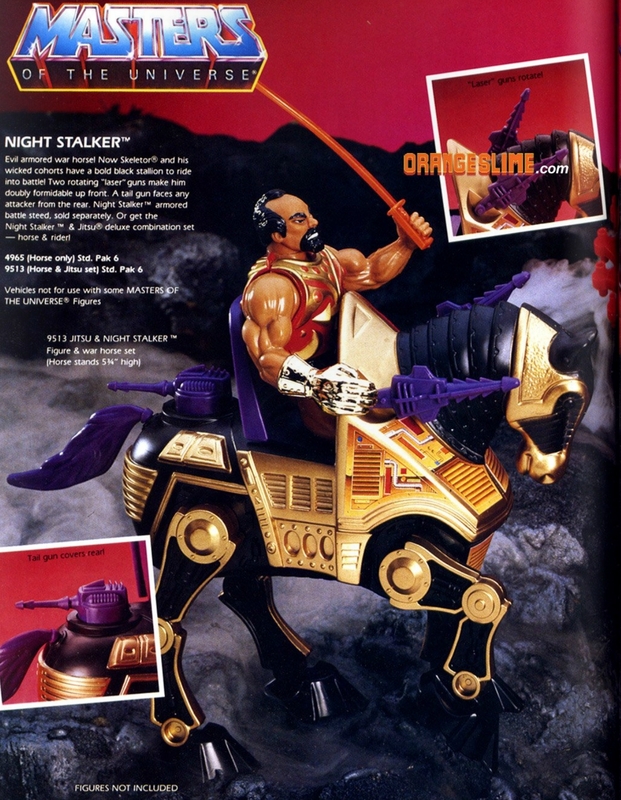 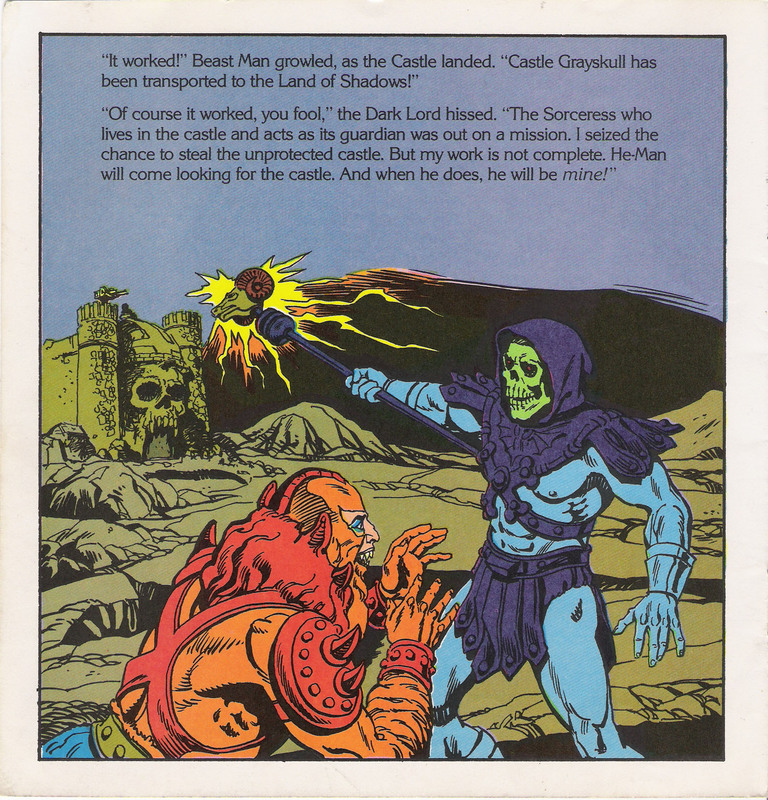 Another Mark Taylor design, Demo Man is often thought of as an early version of Skeletor, although Taylor himself says he was a separate character. 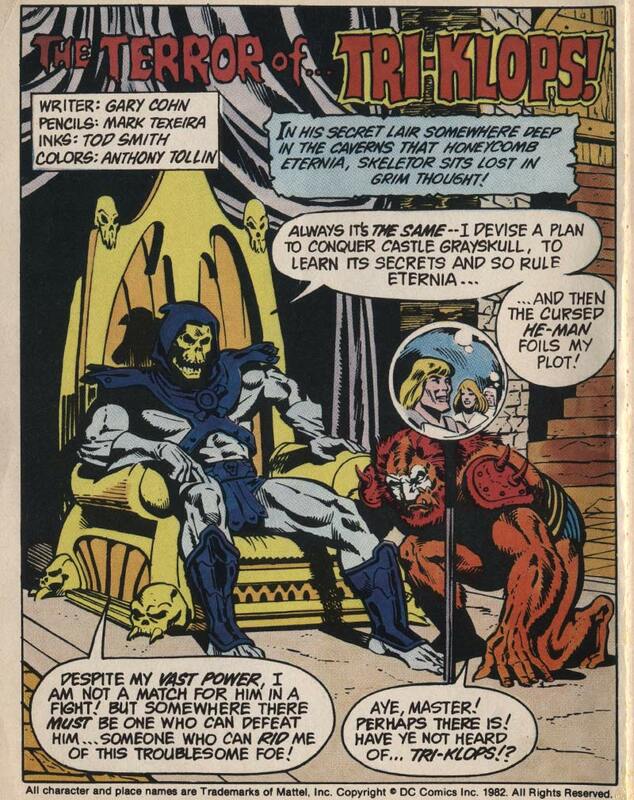 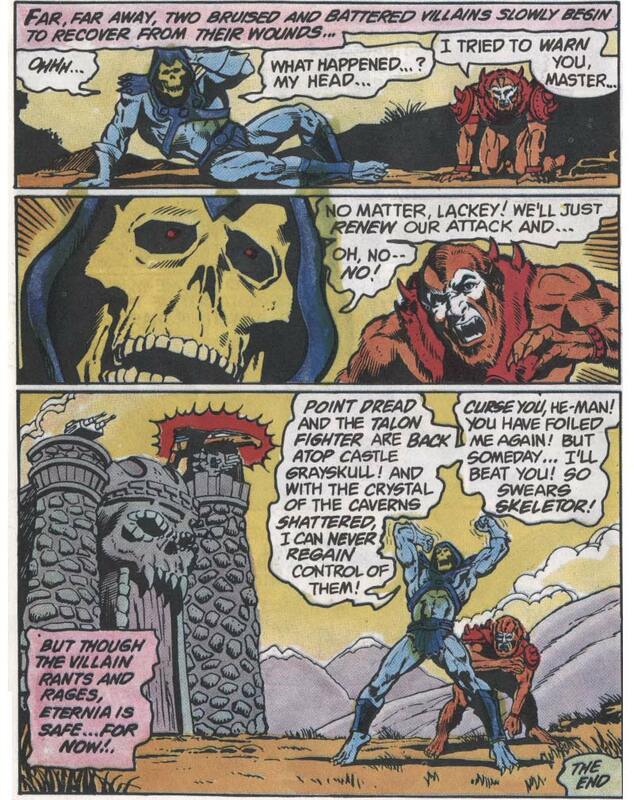 But if you take a close look at his features, he has elements in common with both Beast Man and Skeletor. 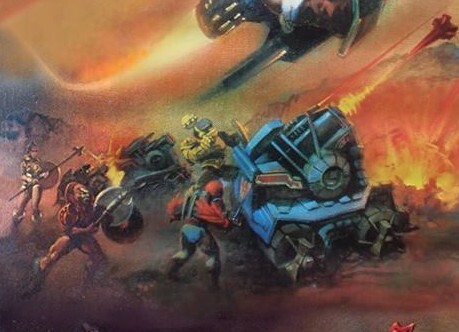 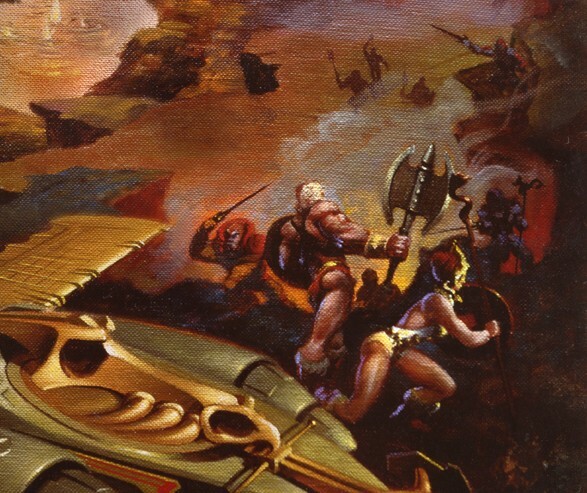 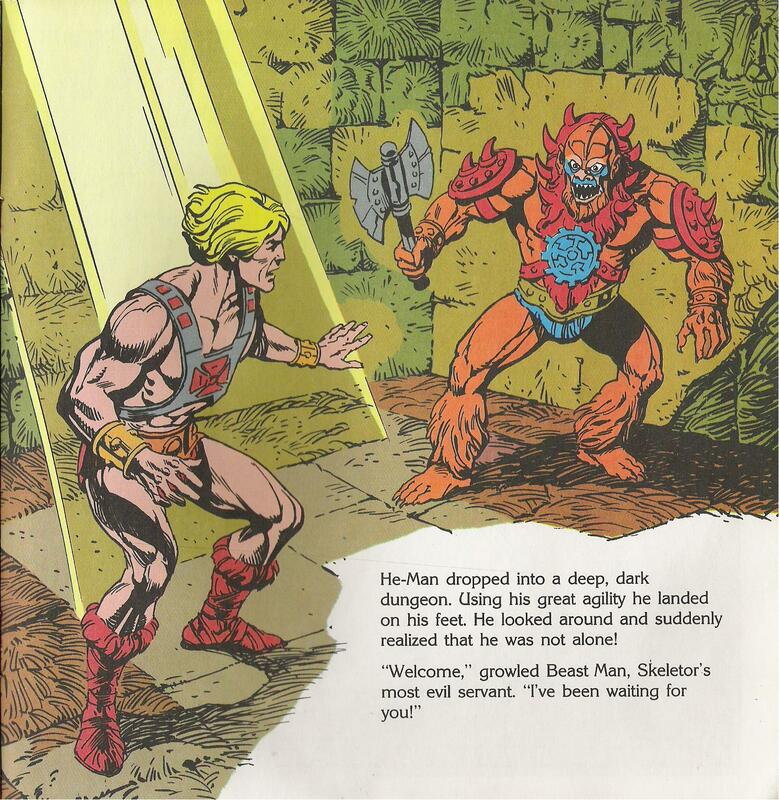 In the drawing above, we can see that Demo Man has a hunched, beastly posture, spiked gauntlets, a spiked arm pad, a whip-like flail weapon, a beard, and even a pendant around his neck that vaguely recalls the one on Beast Man’s armor. 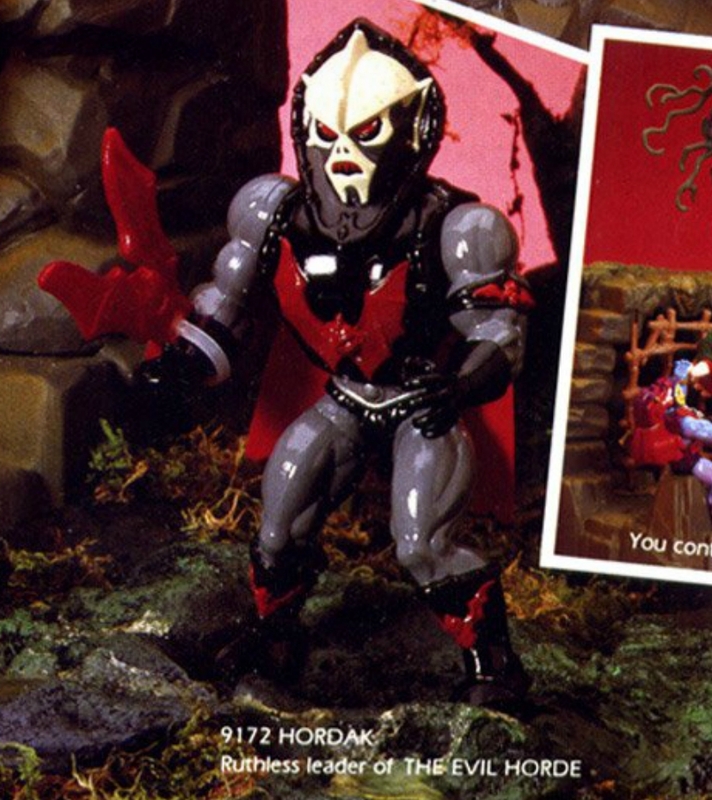 This isn’t Beast Man, but he might be his long lost undead cousin. 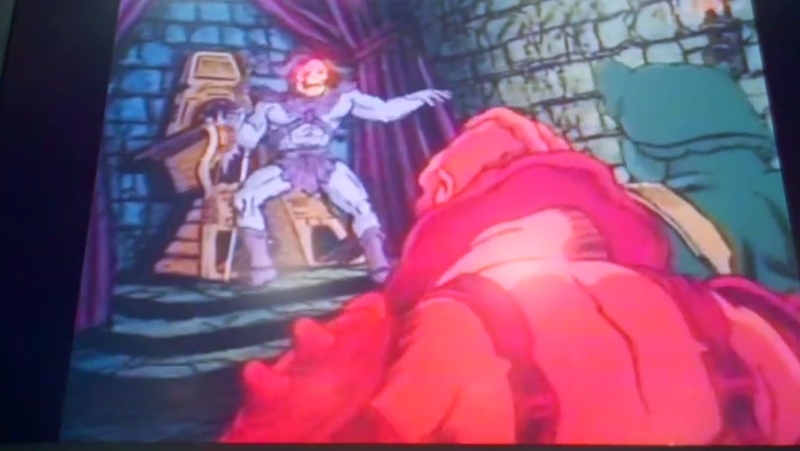 In this version we see a call out for the familiar color scheme of orange fur with red armor. 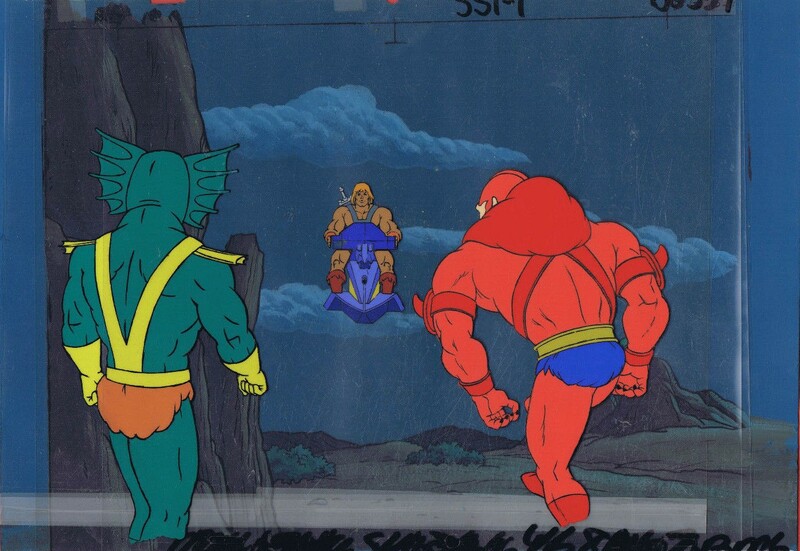 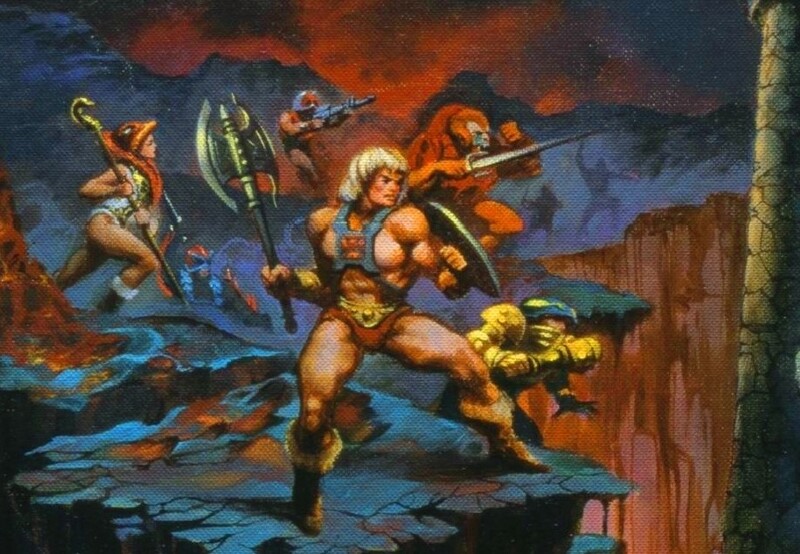 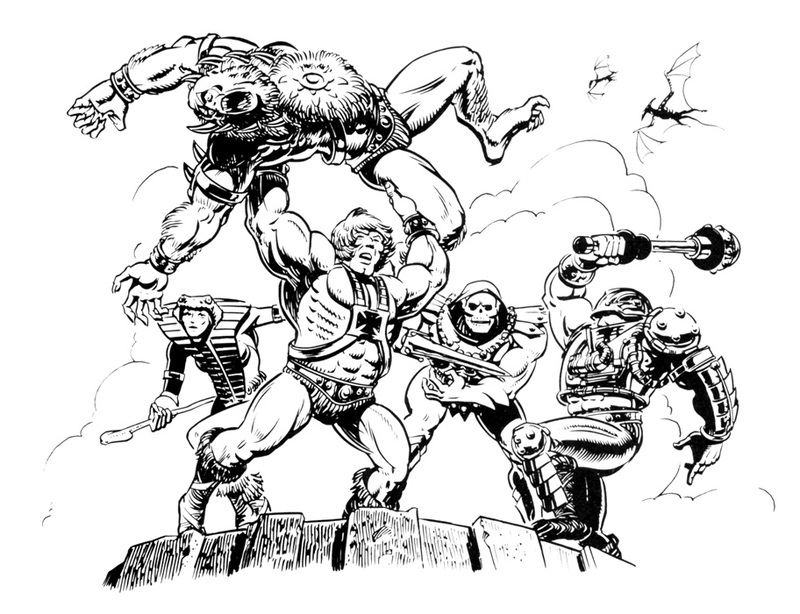 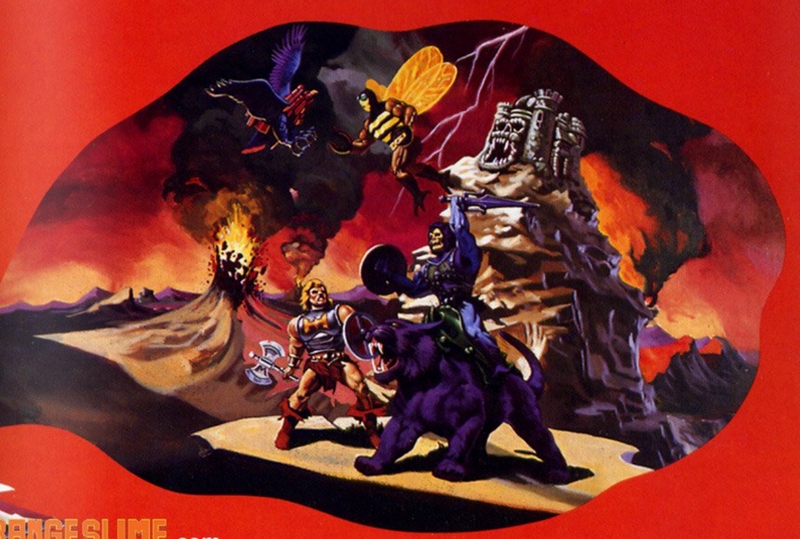 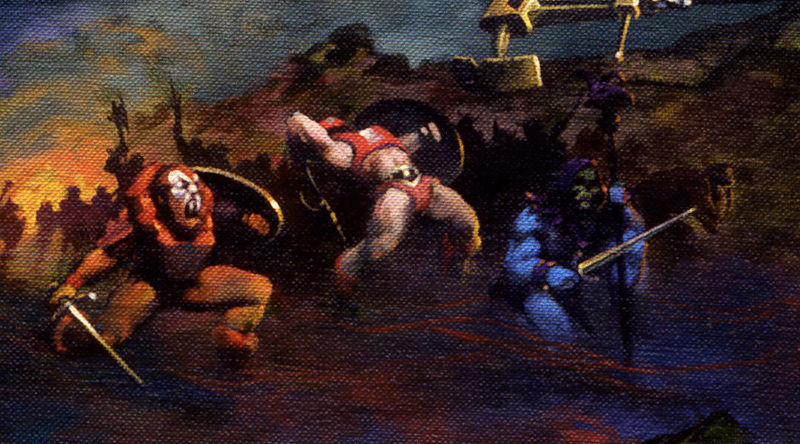 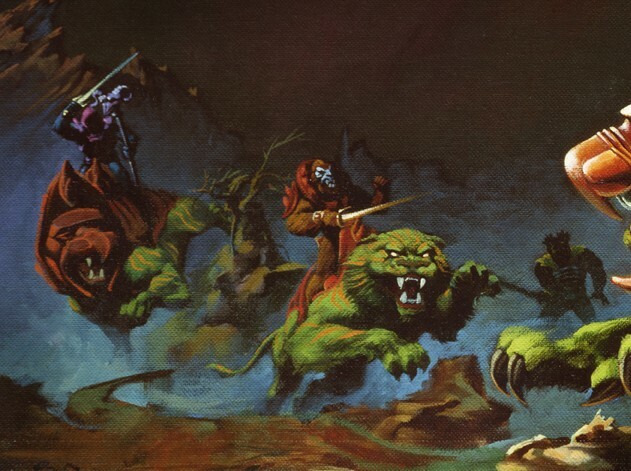 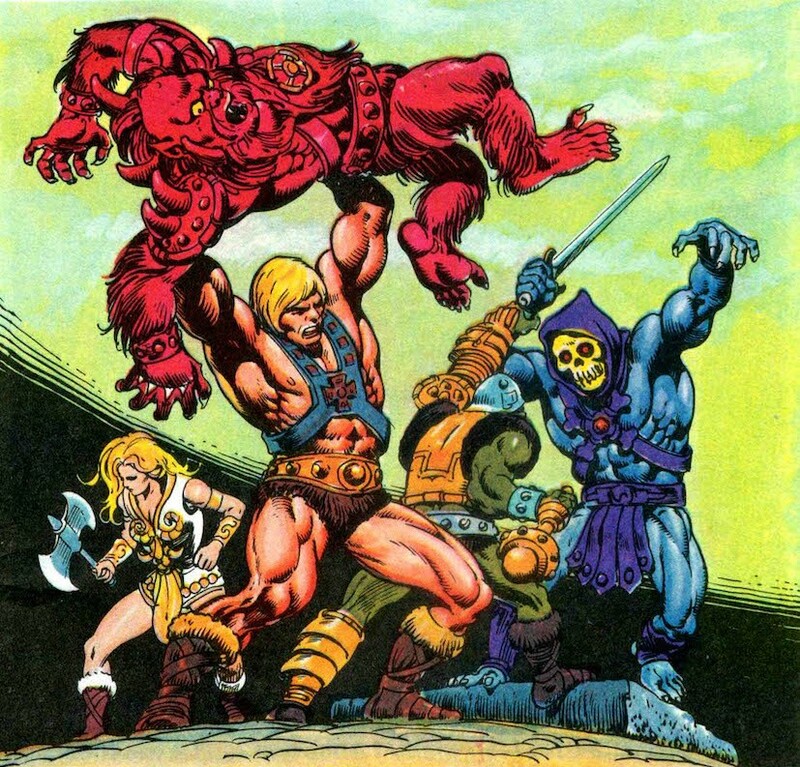 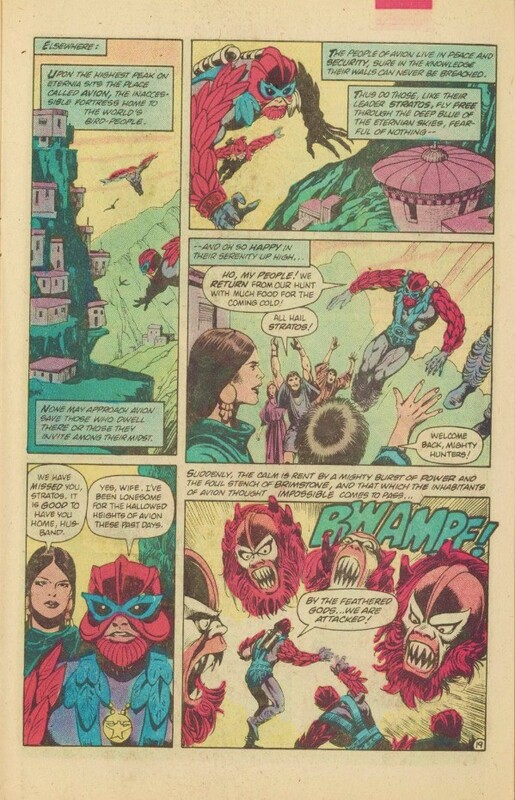 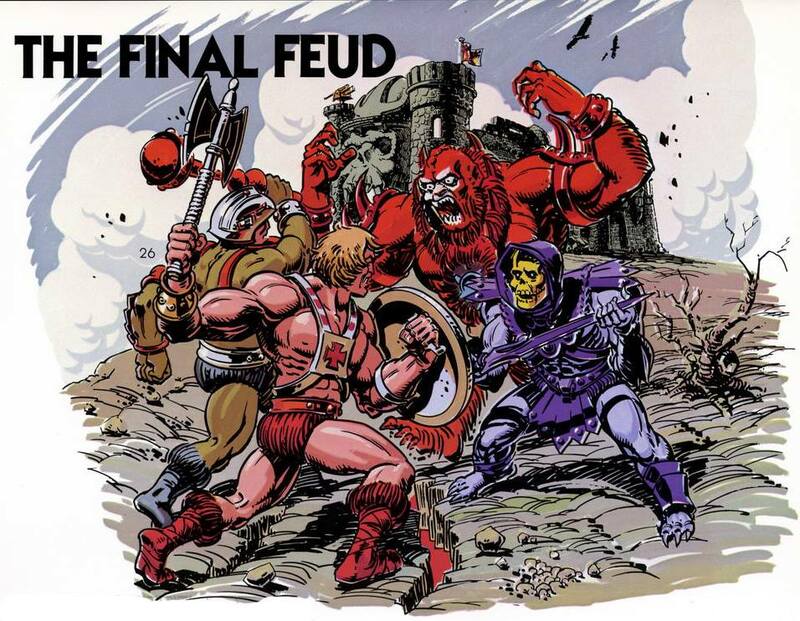 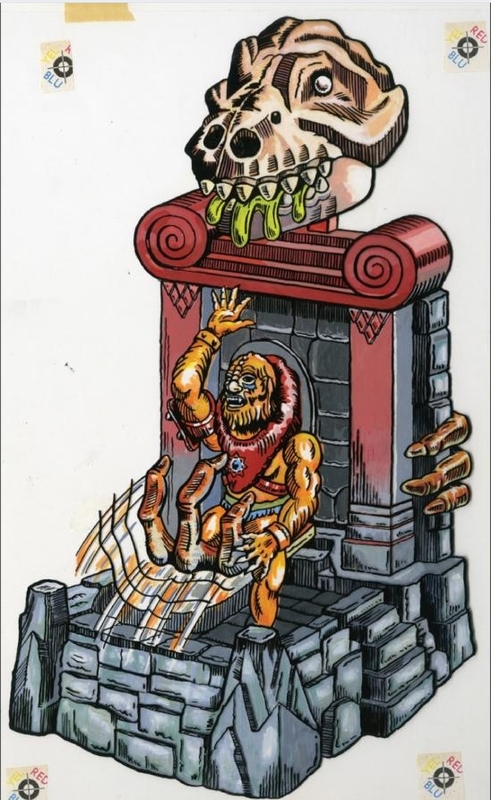 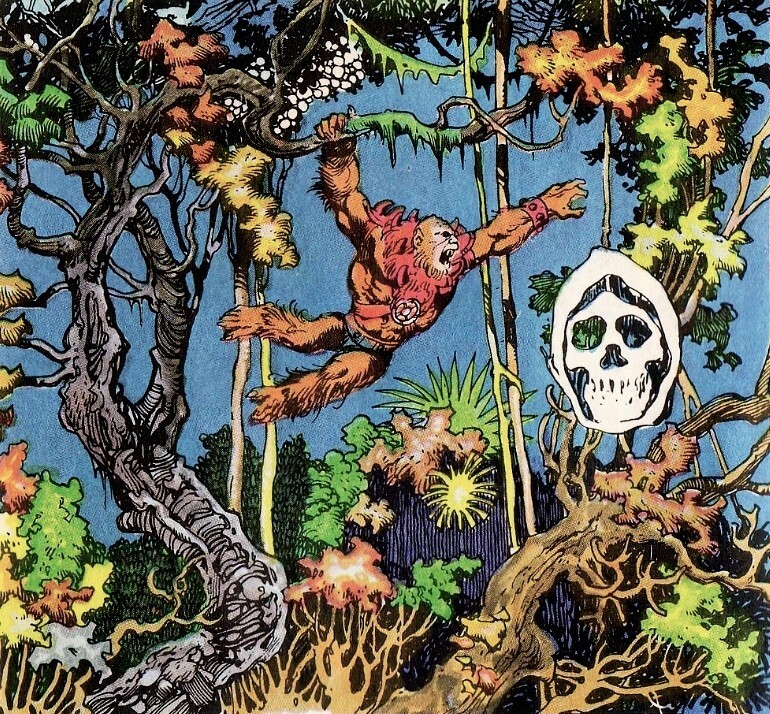 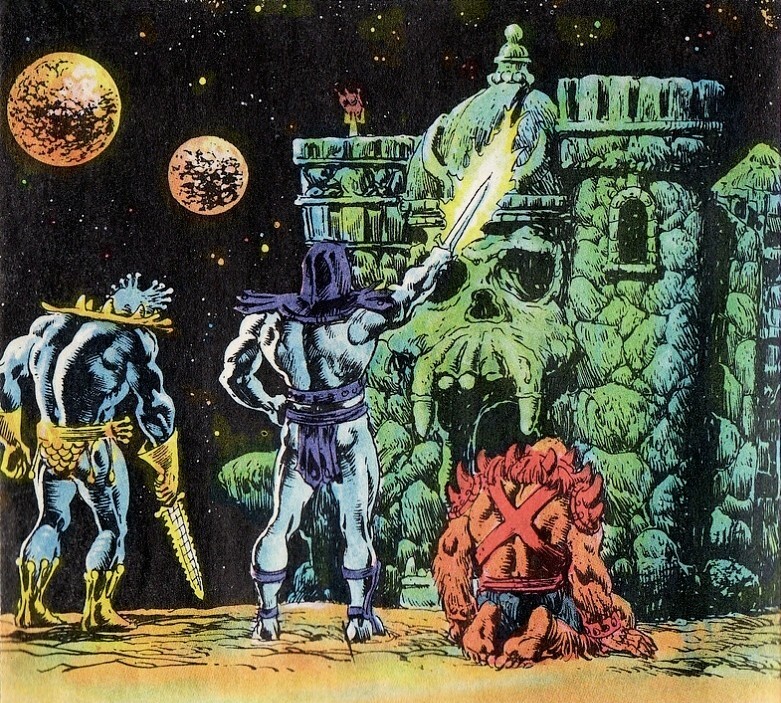 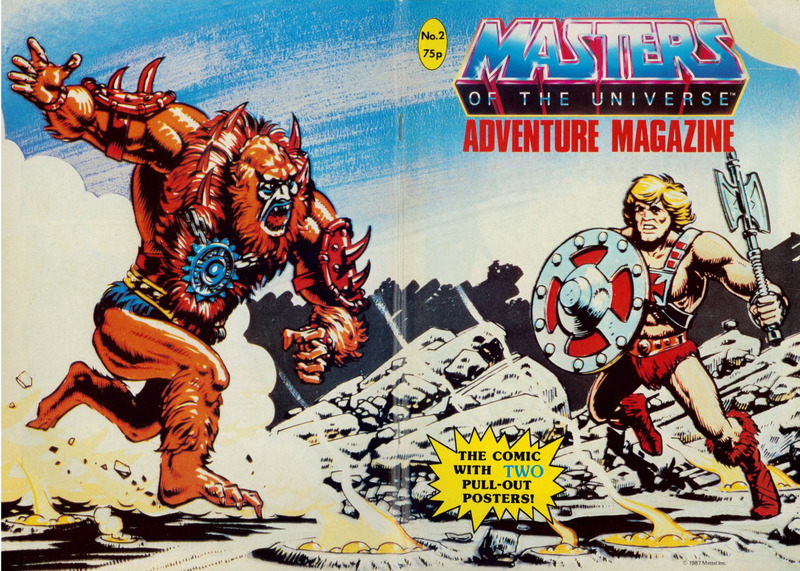 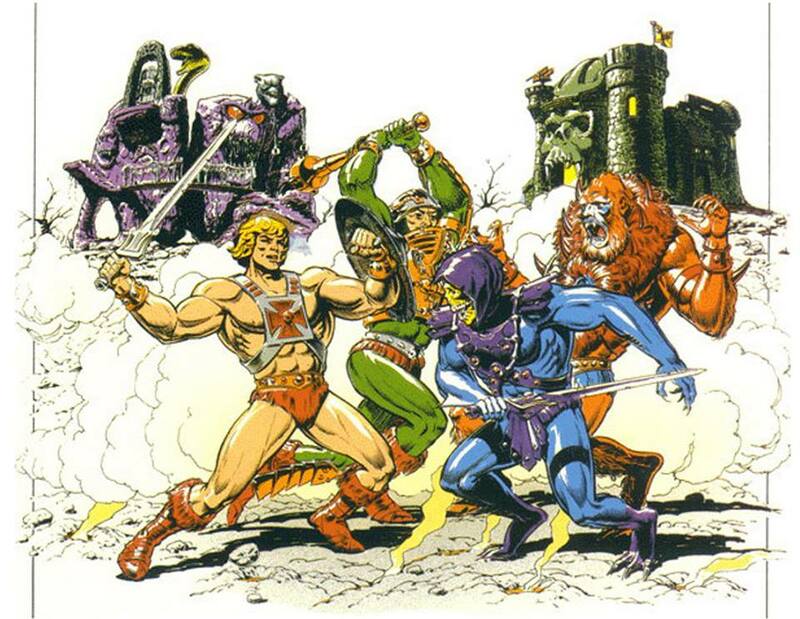 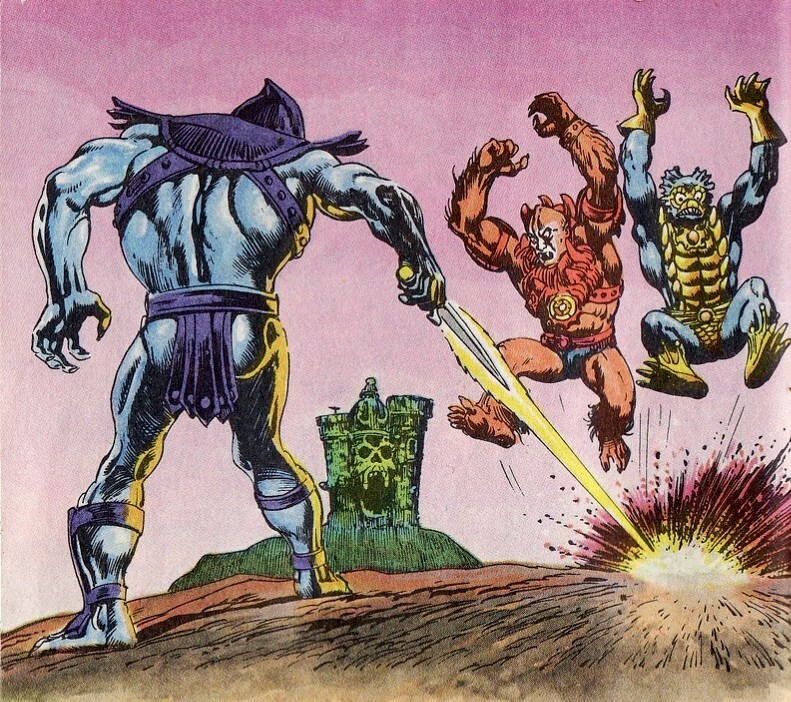 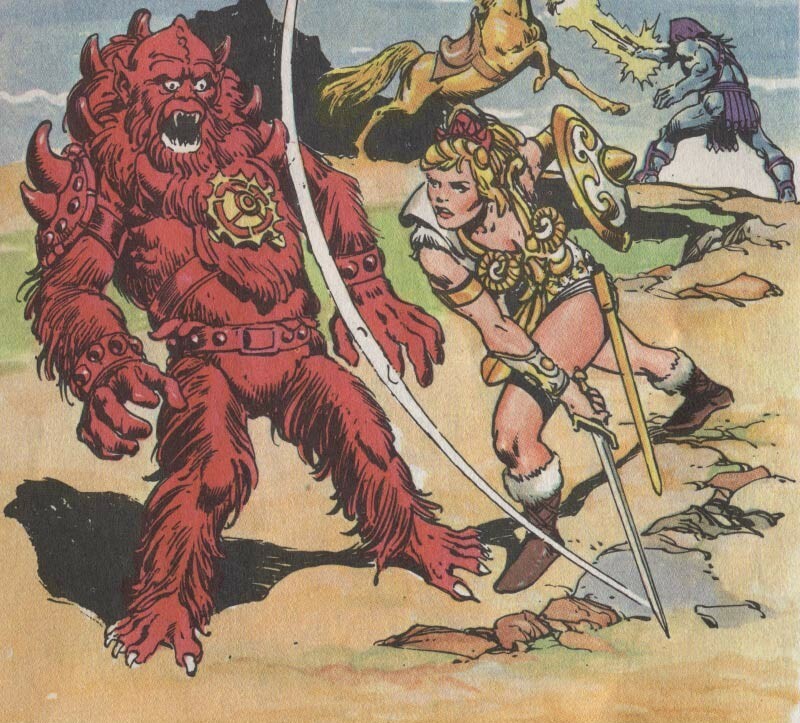 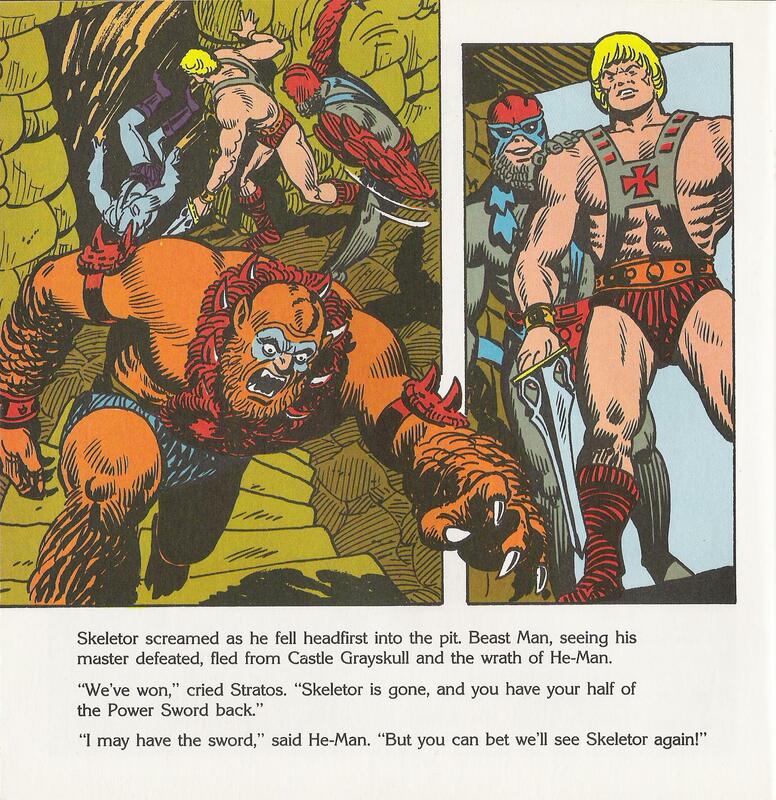 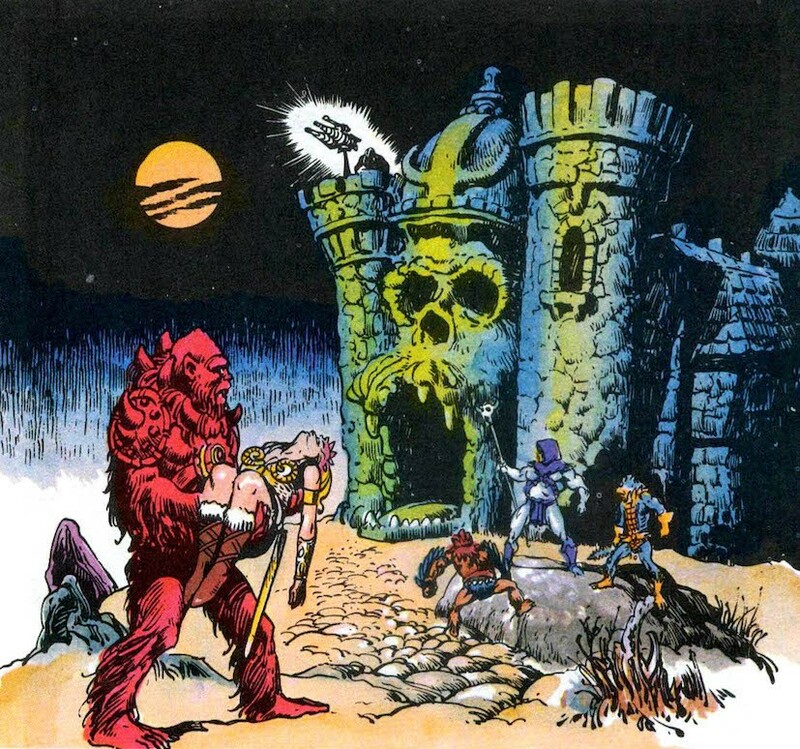 But it appears from the first mini comic (“He-Man and the Power Sword”) that Beast Man’s color scheme was originally dominated by red, like the predecessor bear and gorilla designs. 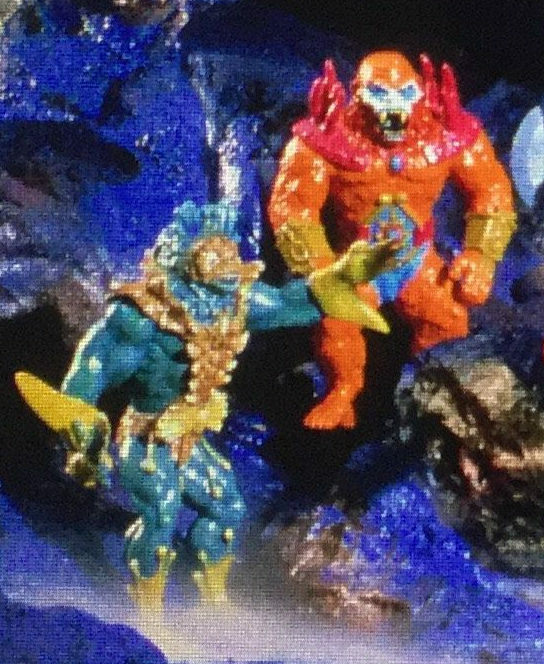 Perhaps they were still playing with color options at this point. 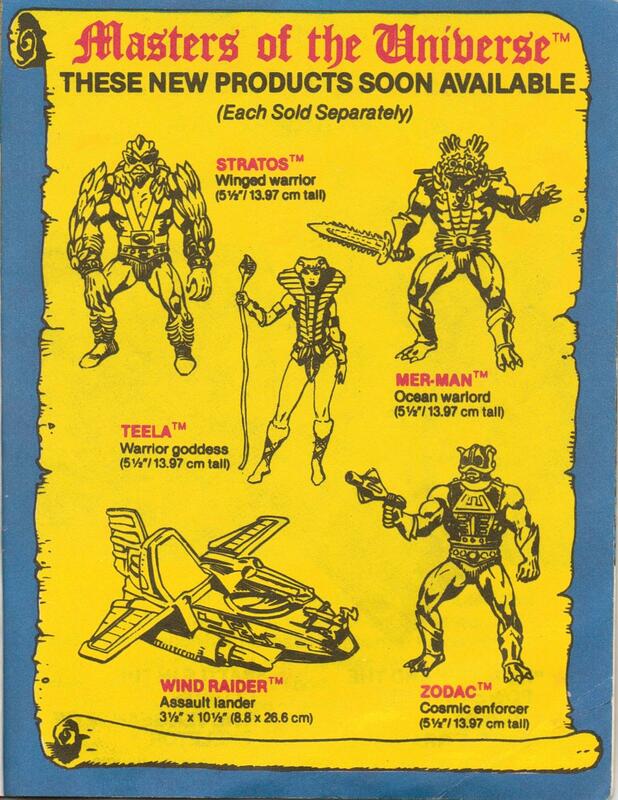 The first mini comics featured cross sell artwork closely patterned after the prototype figures and B-sheet designs. 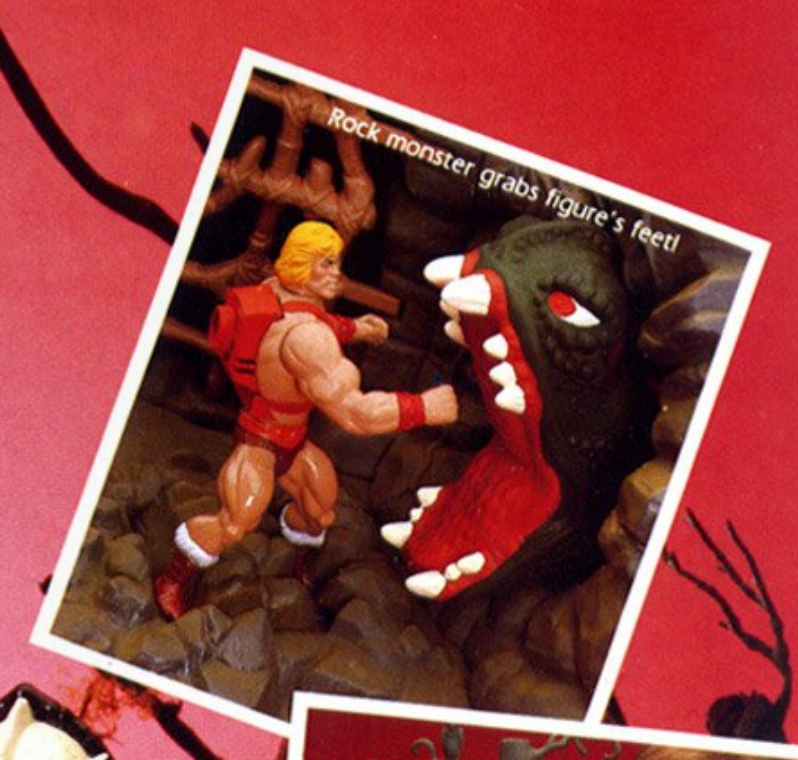 The cross sell artwork that made it onto the back of the packaging was usually (but not always) closer to final. 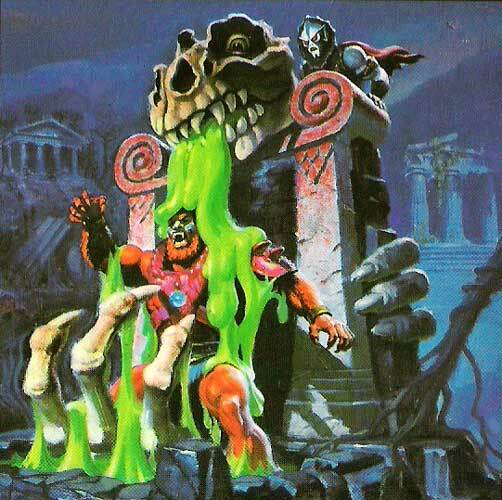 Cross sell artwork used on cardbacks. 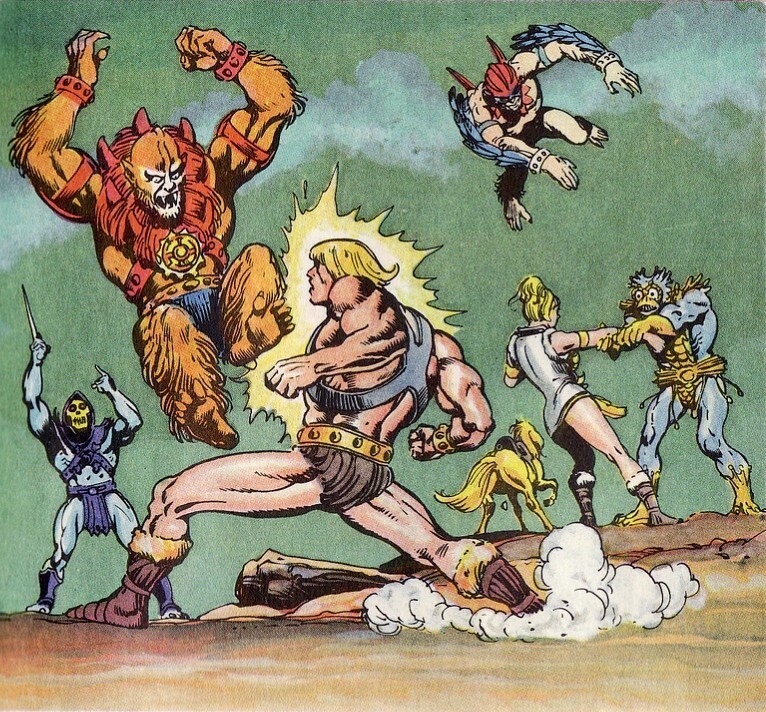 Image courtesy of Axel Giménez. 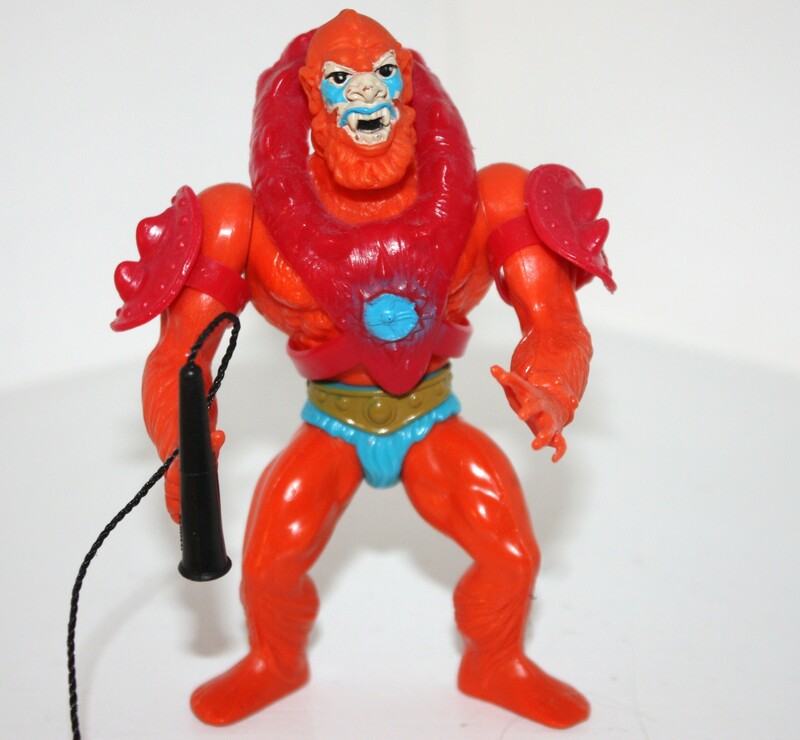 This late stage prototype Beast Man (below) shows the finalized sculpt and color scheme. 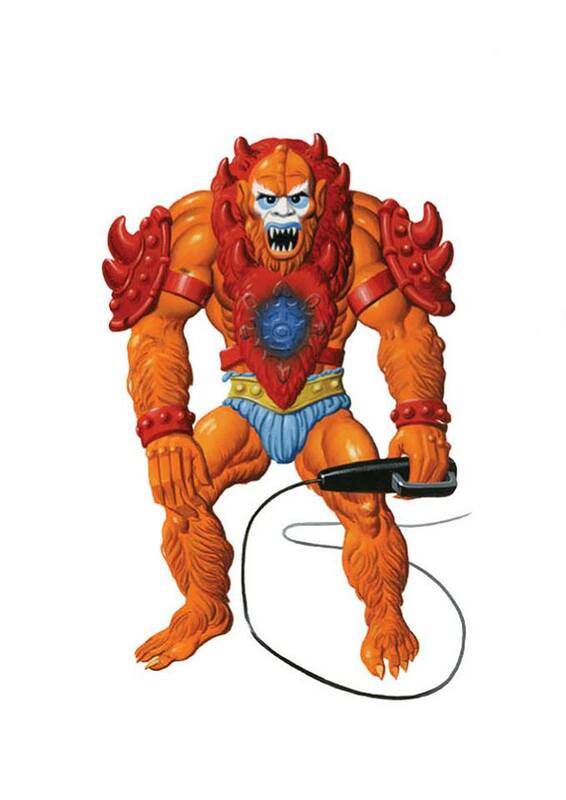 Note the compass element on Beast Man’s armor, the spikes around his neck, and the spiked weapon on his hand – all elements from previous Mark Taylor designs. 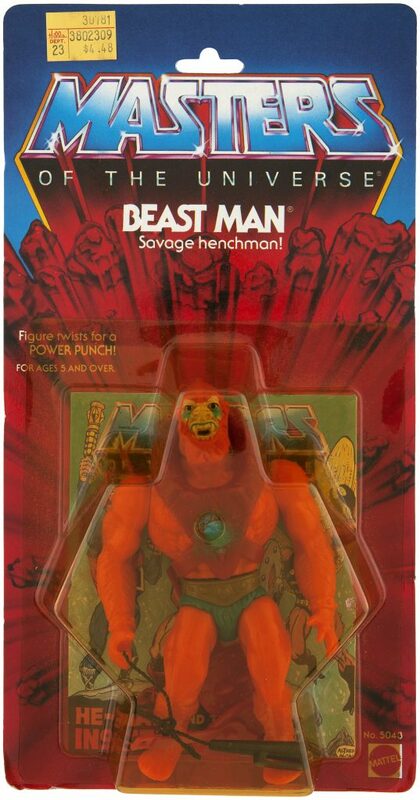 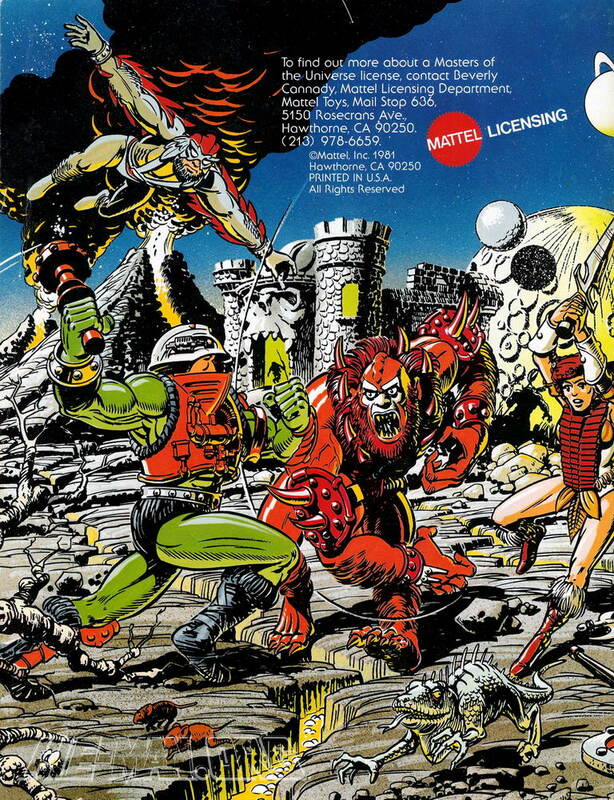 The name “Beast Man” may have been consciously or unconsciously borrowed from the Beastman figure from Mattel’s Flash Gordon line. 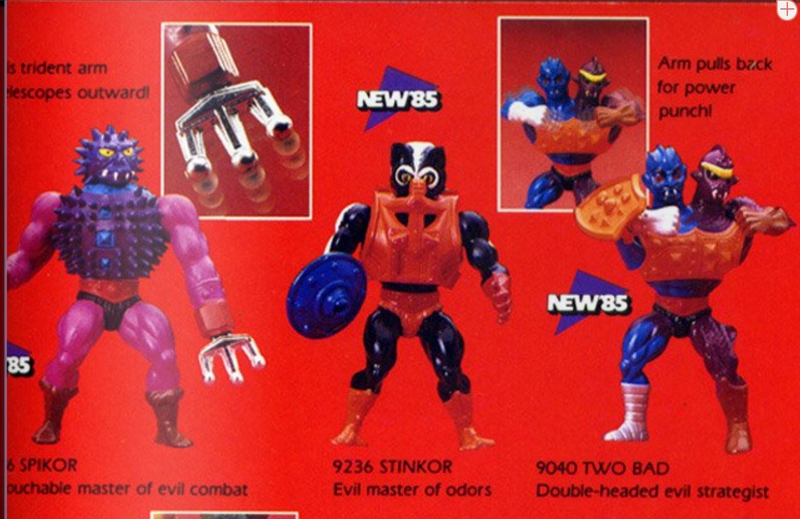 As a side note, the accessories count seems pretty methodically planned for the first wave of figures. 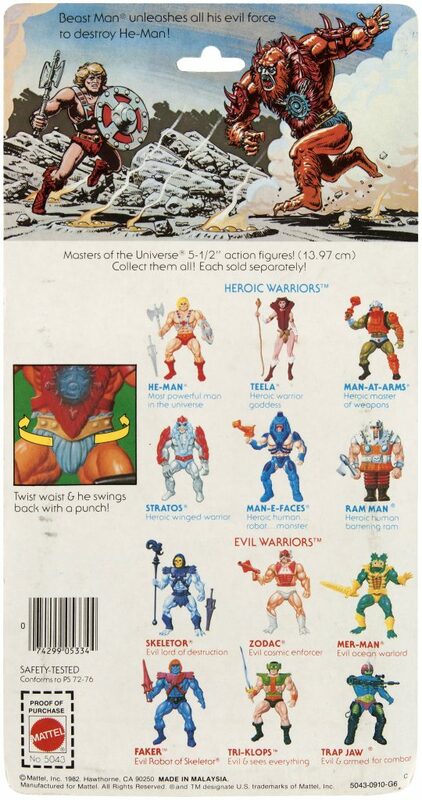 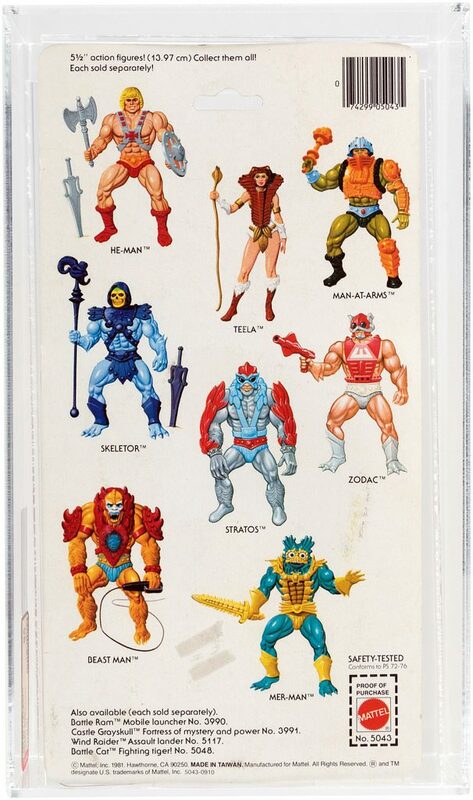 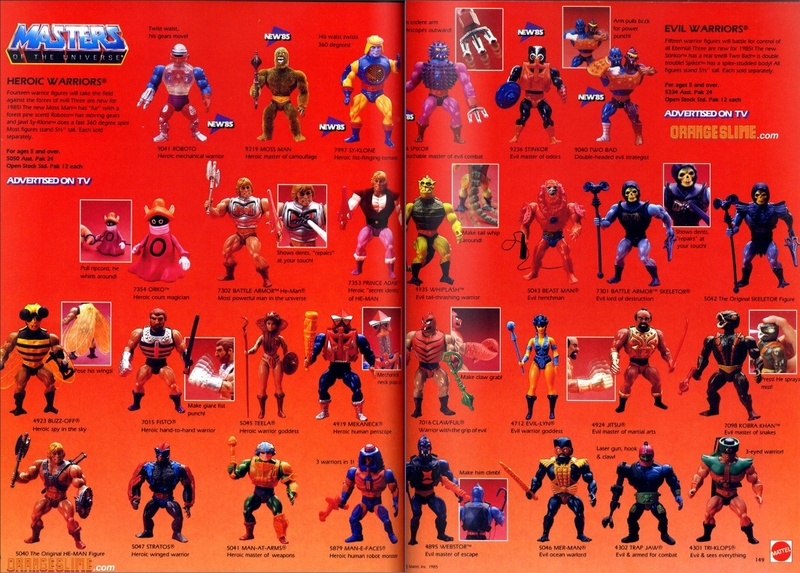 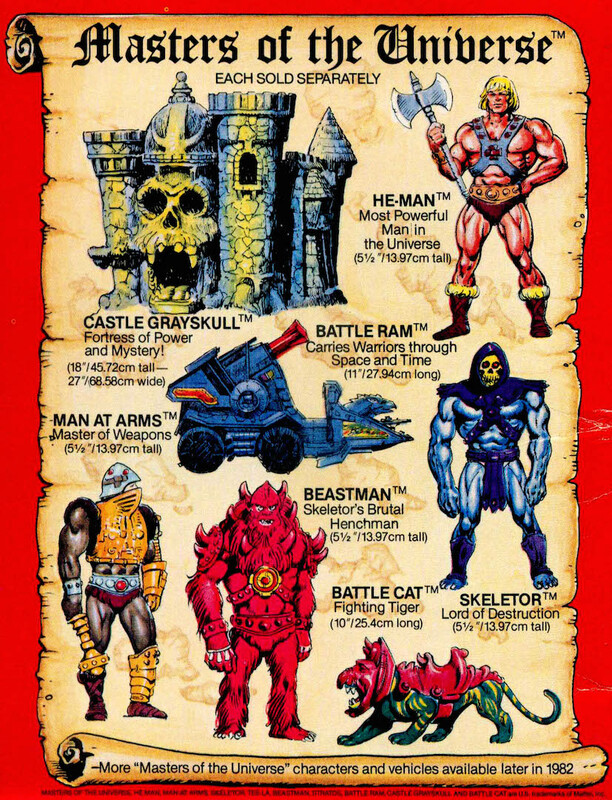 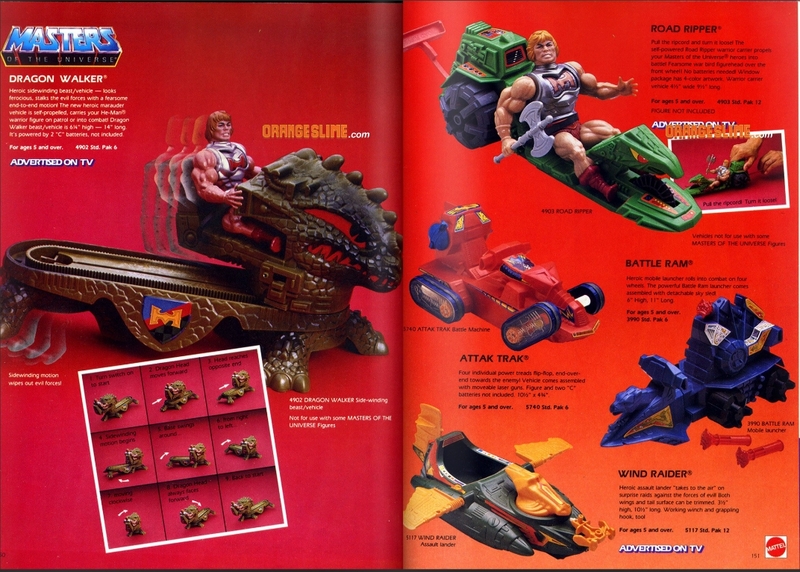 Figures in the first half of the first wave (He-Man, Man-At-Arms, Skeletor and Beast Man) were packaged with four accessories each, in various combinations of removable armor, weapons, and/or shields. 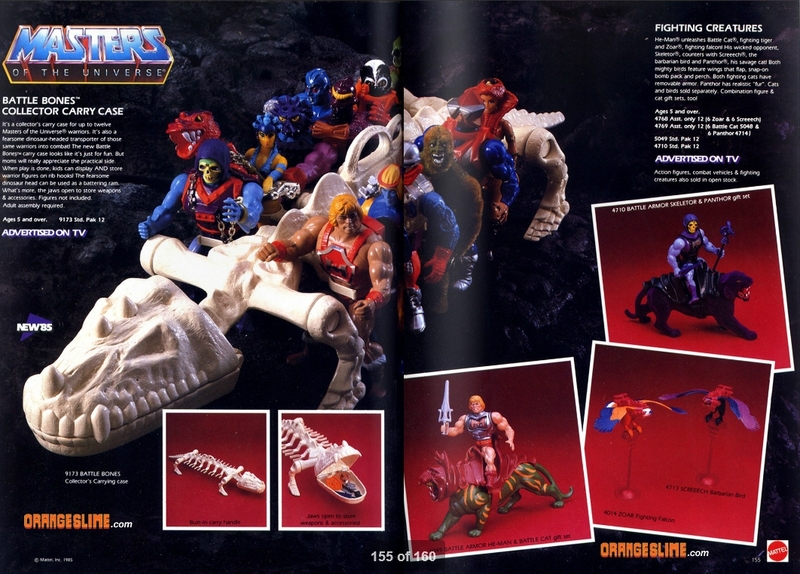 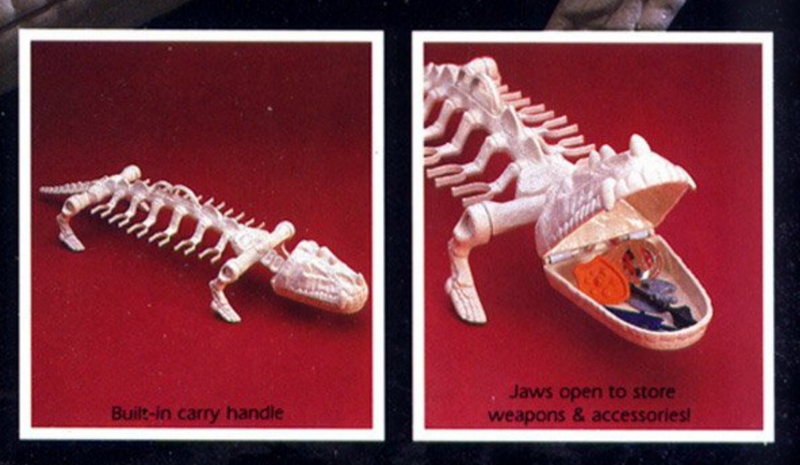 The second half of the first wave was somewhat cost reduced, with two to three accessories included per figure. 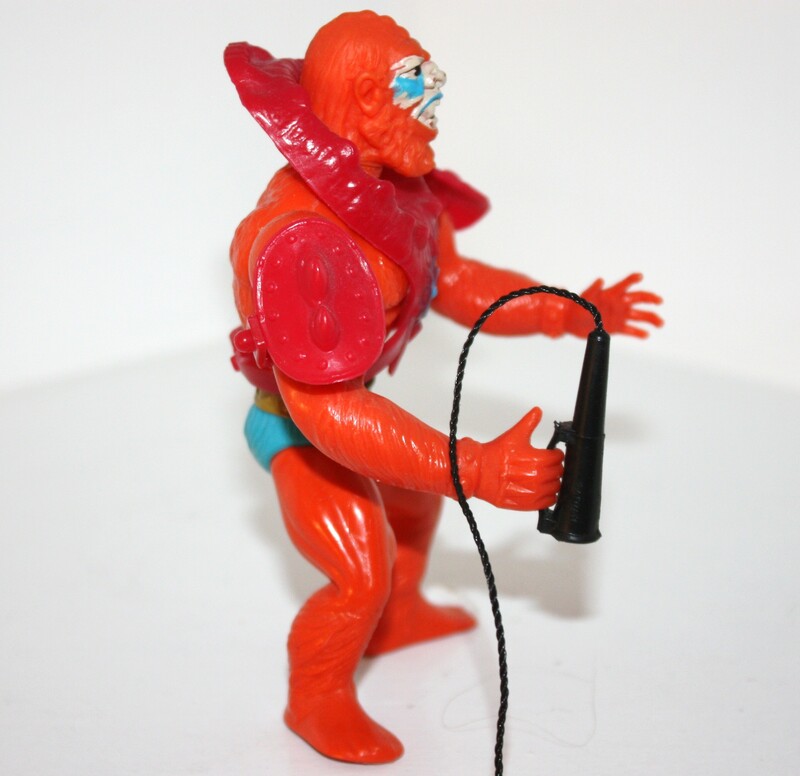 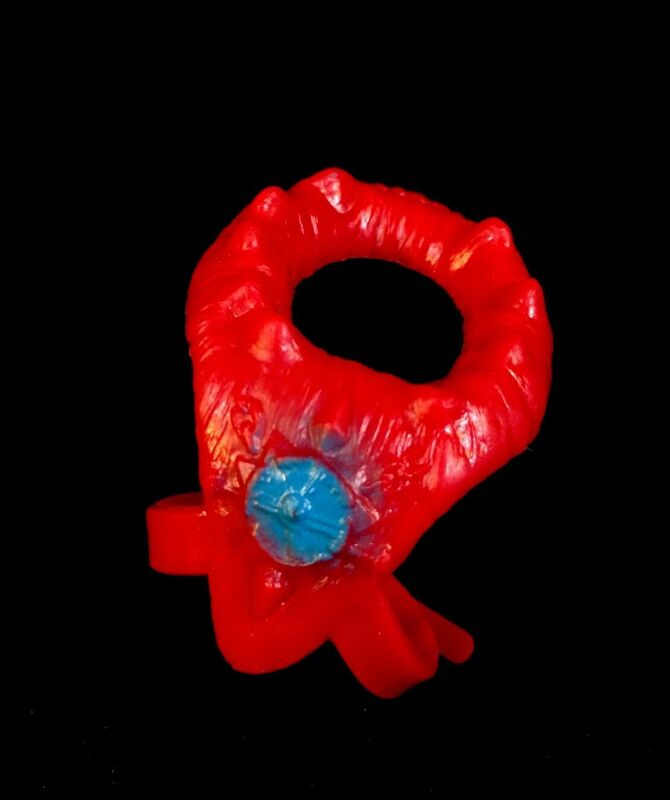 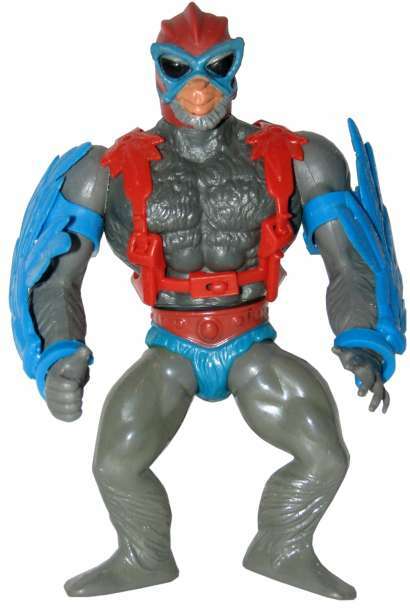 In any case, Beast Man’s armor is the characteristic soft plastic used throughout 1982 and 1983. 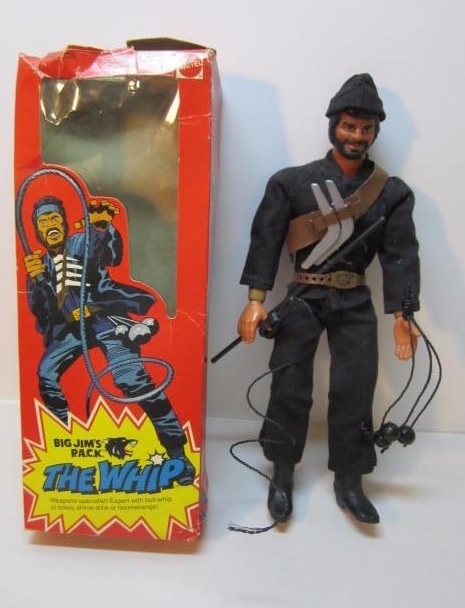 His whip (designed for a 12-inch figure, it’s technically too big for him, and he has to hold it by the hand guard) has a plastic handle and a cloth string. 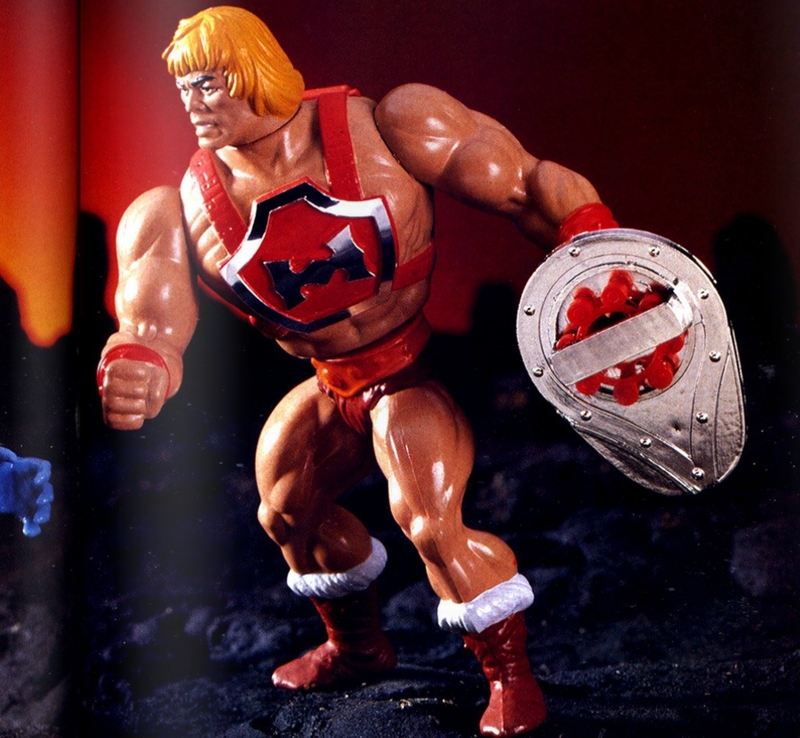 He is one of only three 1982 figures to be given a paint application on his armor (the others are He-Man and Zodac). 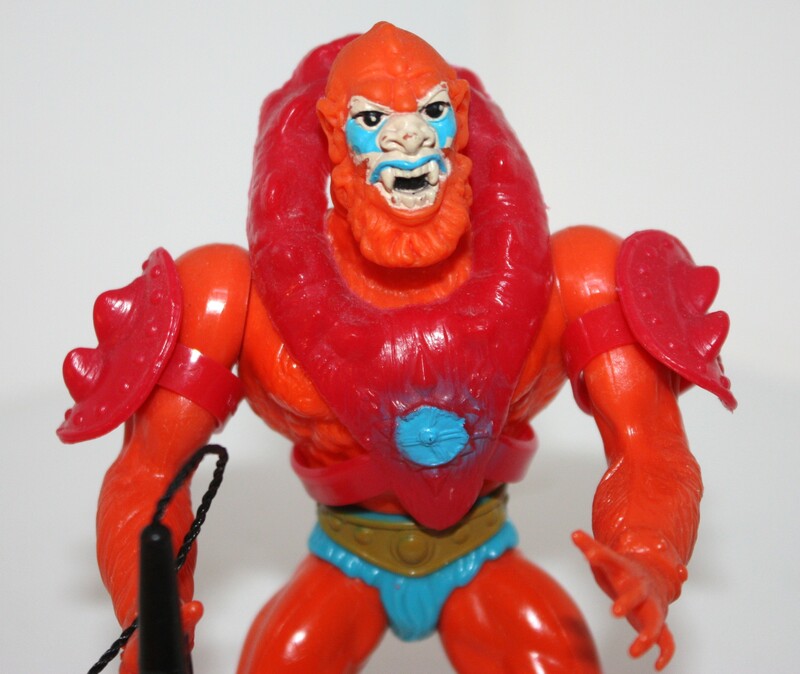 The compass-like shape on Beast Man’s chest armor is painted blue. 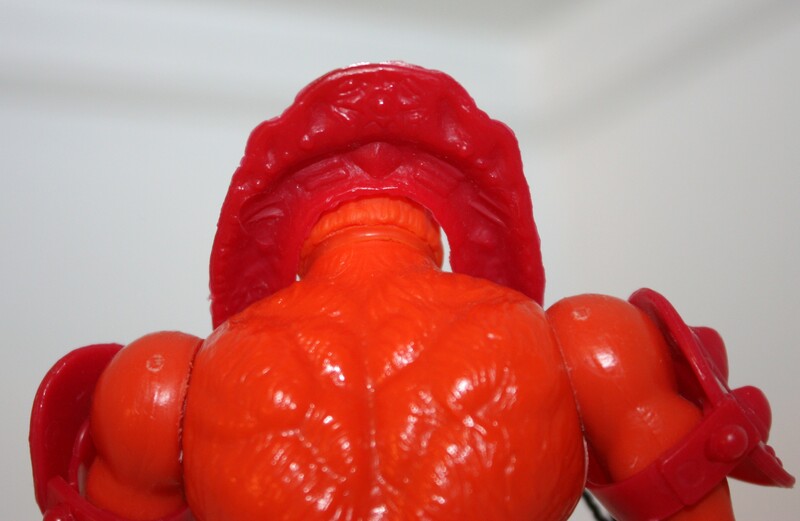 There is an unpainted, smaller version of the compass on the back of his chest armor. 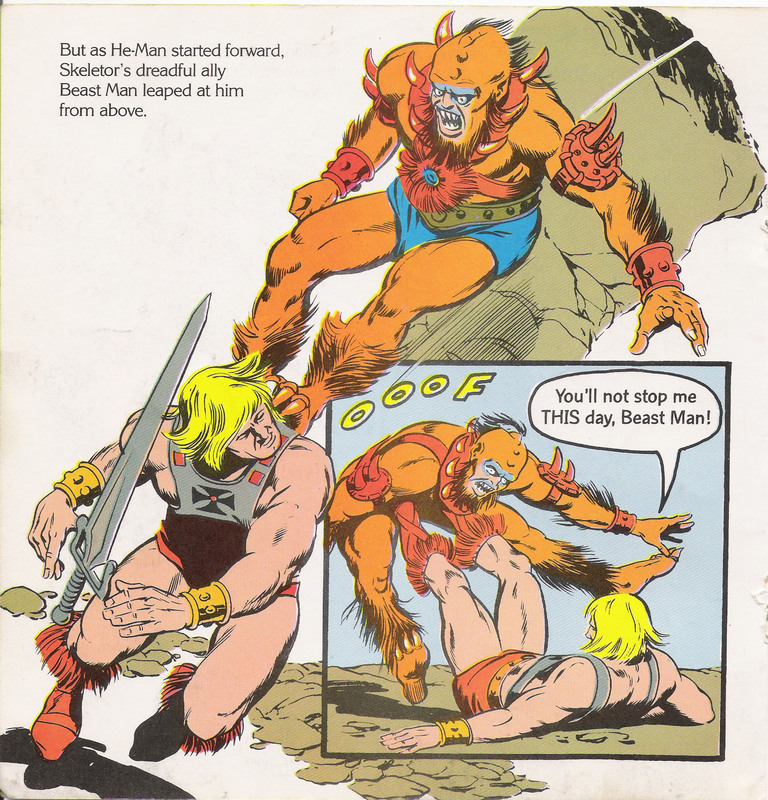 Beast Man featured shorter legs and longer arms than He-Man or Skeletor, befitting his ape-like appearance. 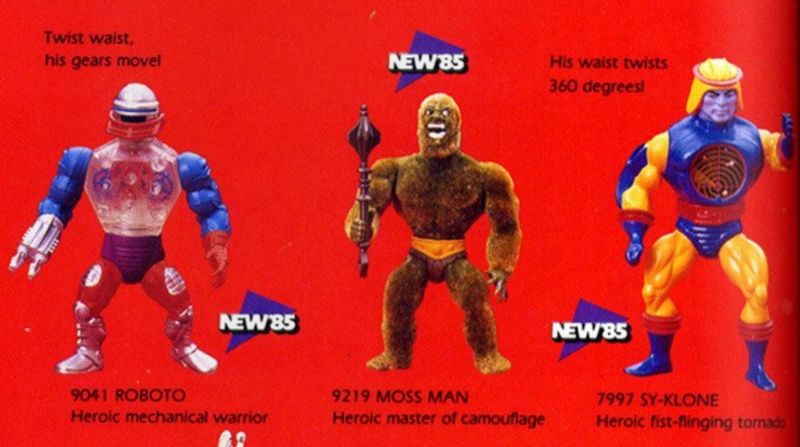 His legs, arms and chest were later reused to make Stratos and Moss Man (the latter also reused Beast Man’s head). 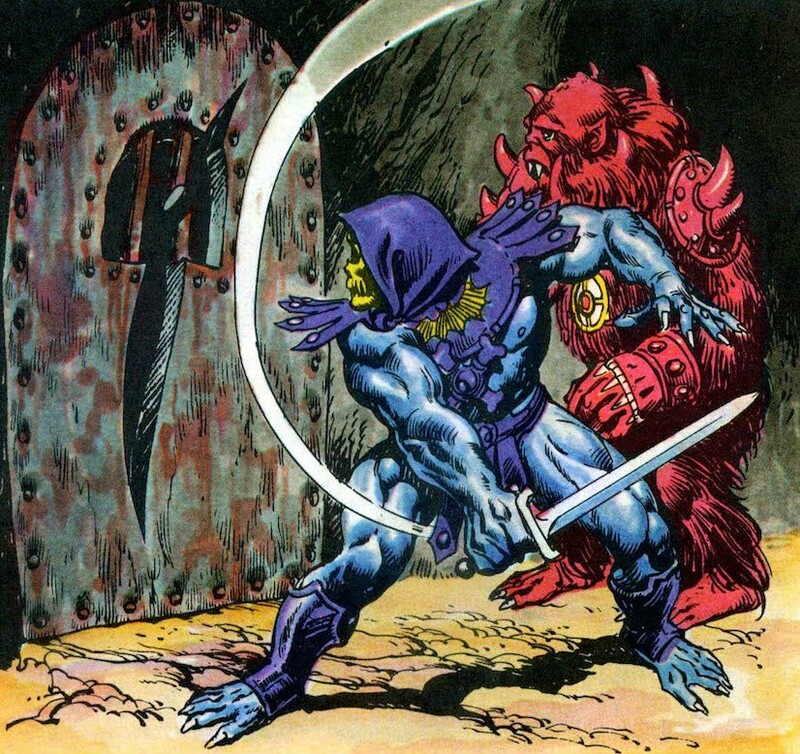 Beast Man is probably the most essential evil warrior next to his master, Skeletor. 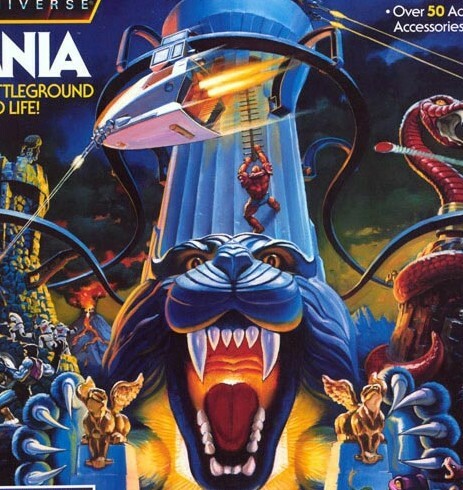 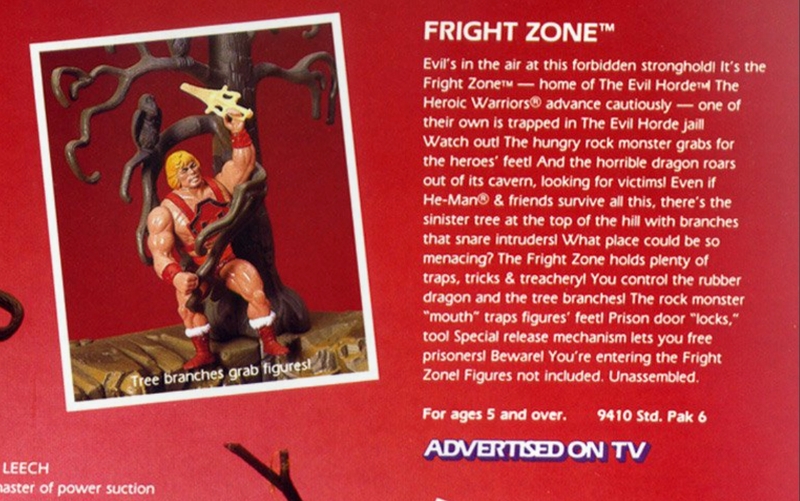 So, it’s no surprise that he was heavily featured on the box art, appearing on five of the six boxes released in 1982. 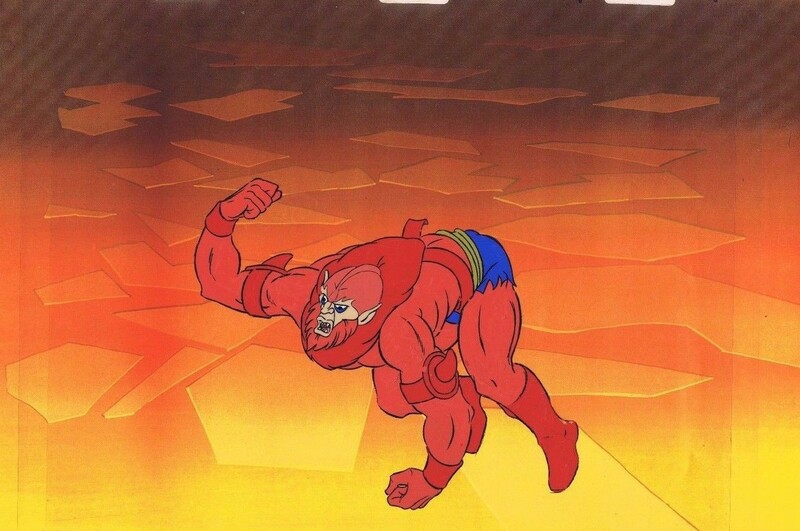 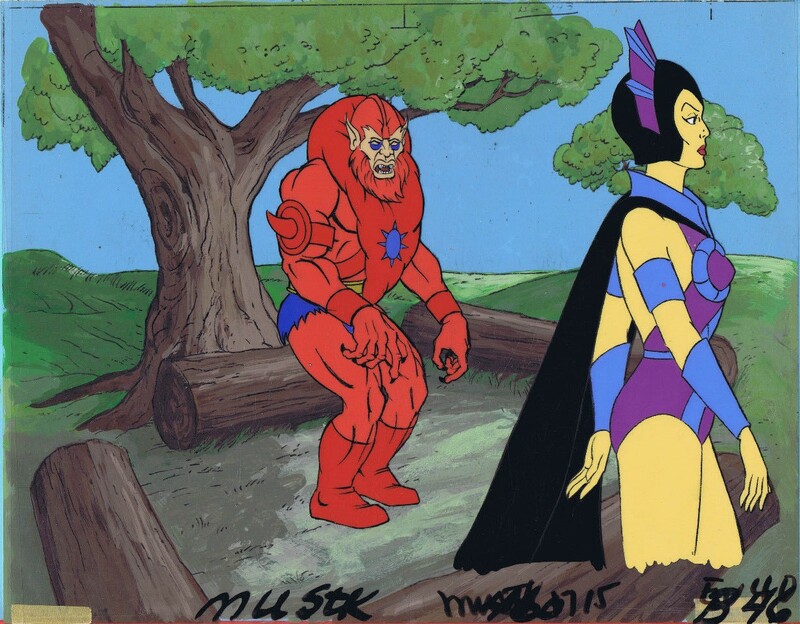 Beast Man was also a permanent fixture on the Filmation cartoon. 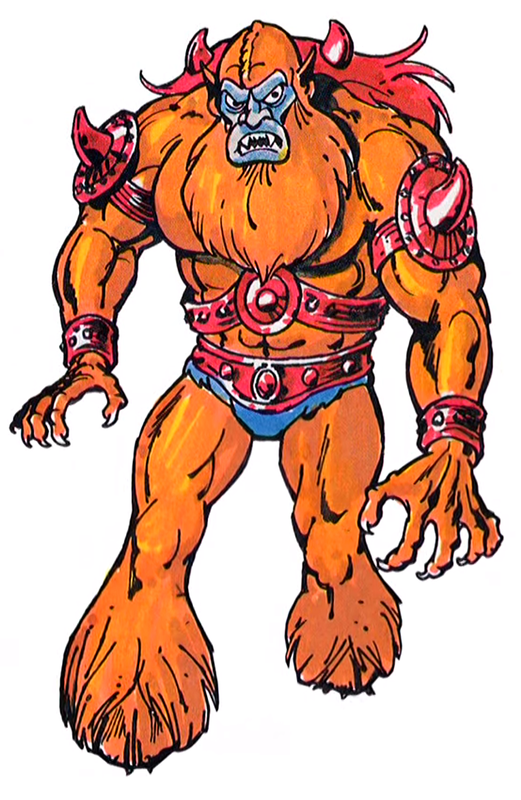 Early in his development for the show, Beast Man featured very heavy fur on his lower legs that resembled bell bottoms. 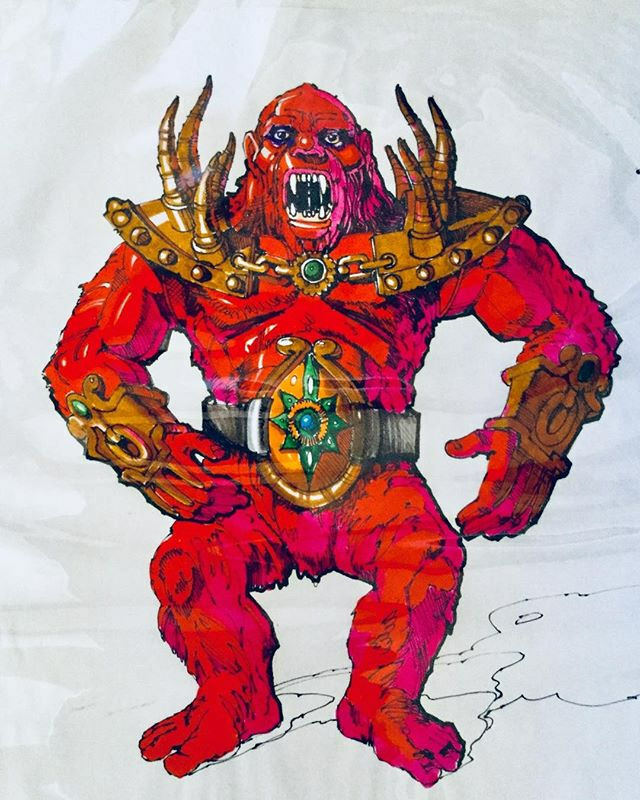 This design is actually kind of a halfway point between Beast Man’s first and second prototypes, at least in terms of his costume. 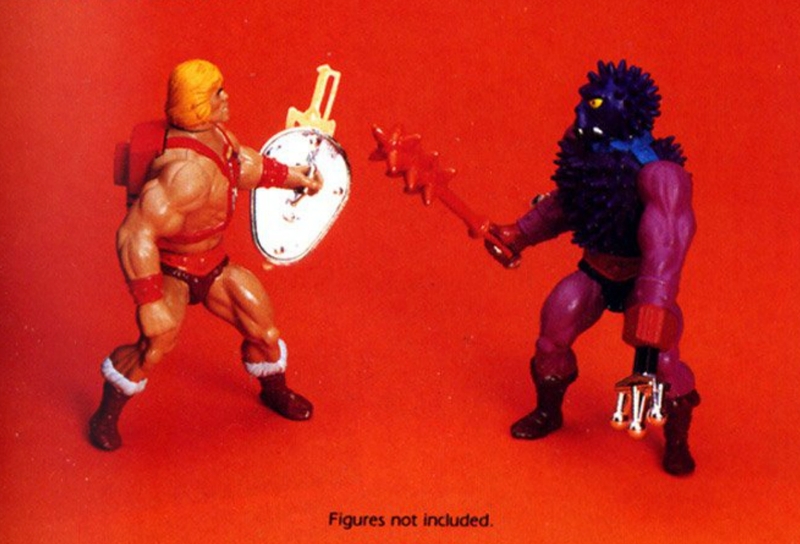 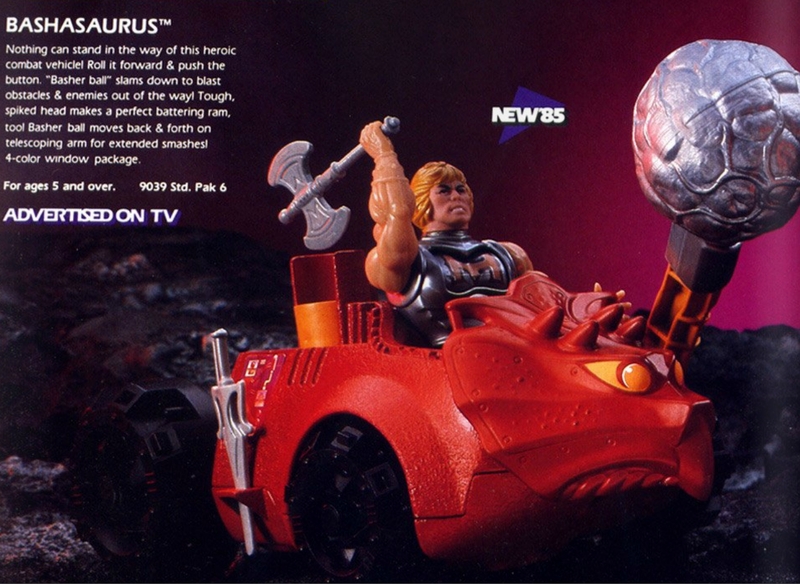 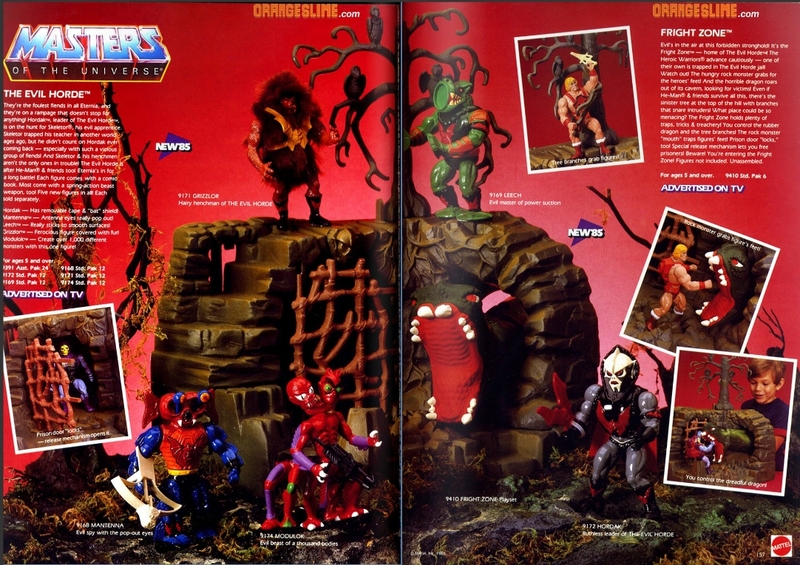 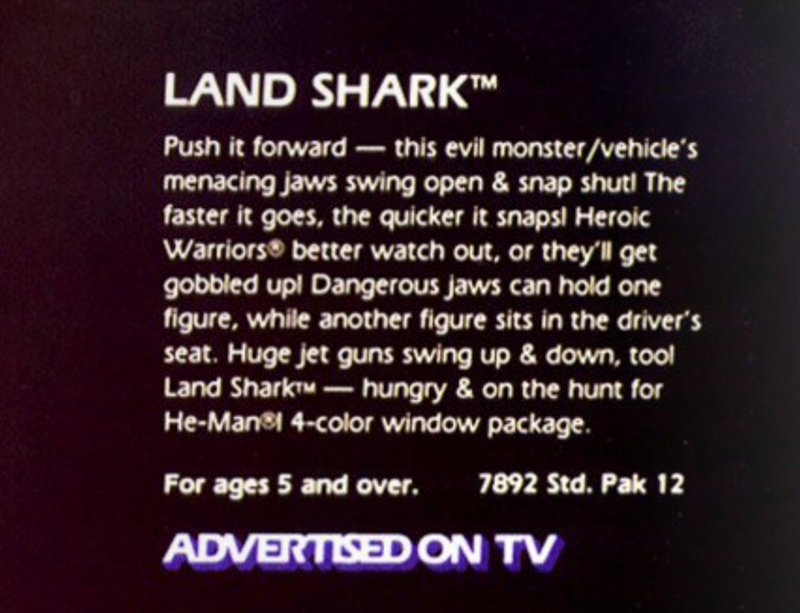 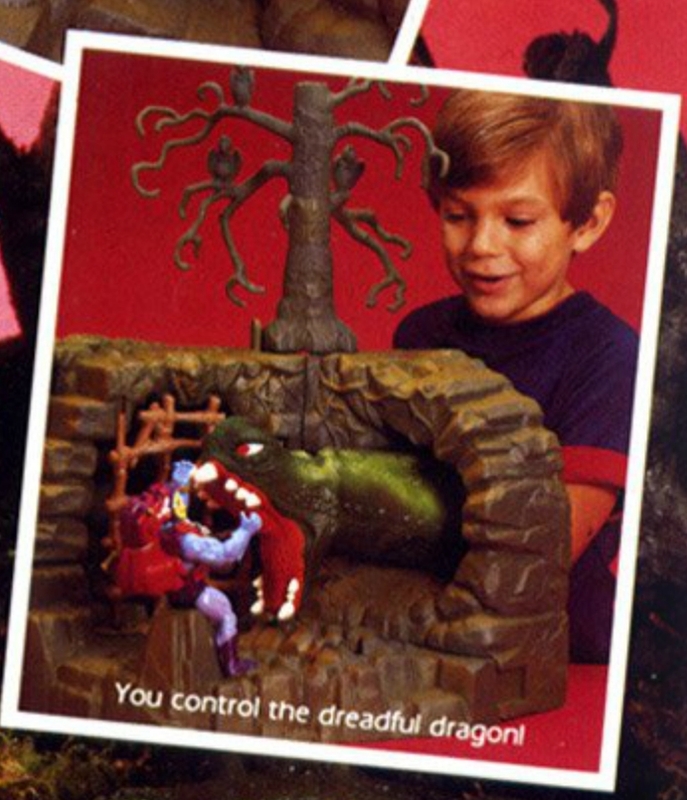 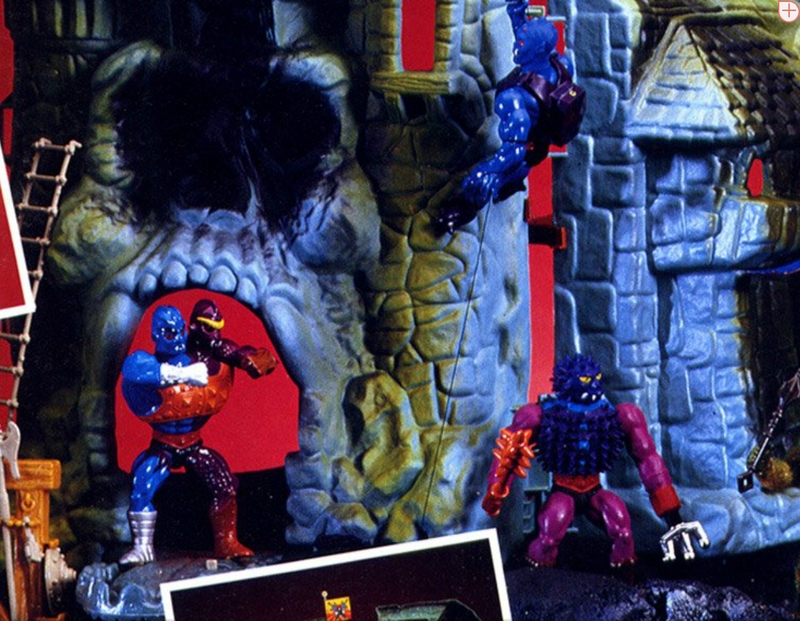 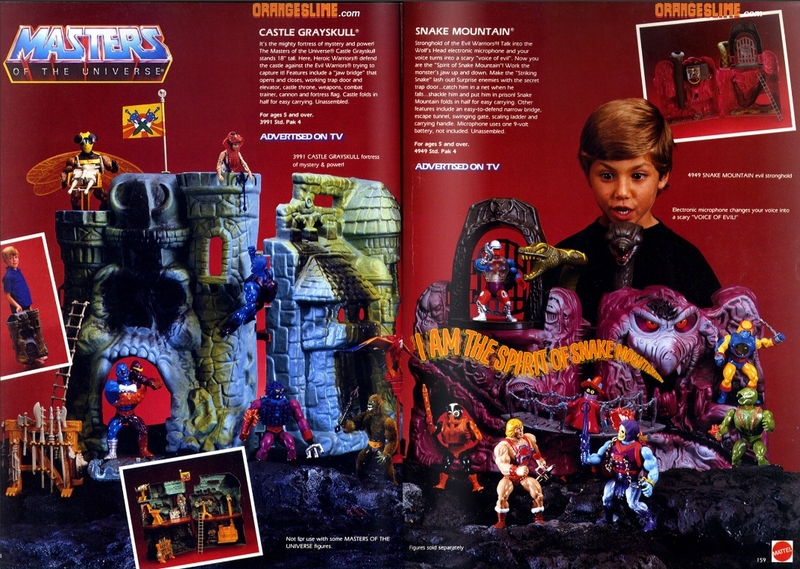 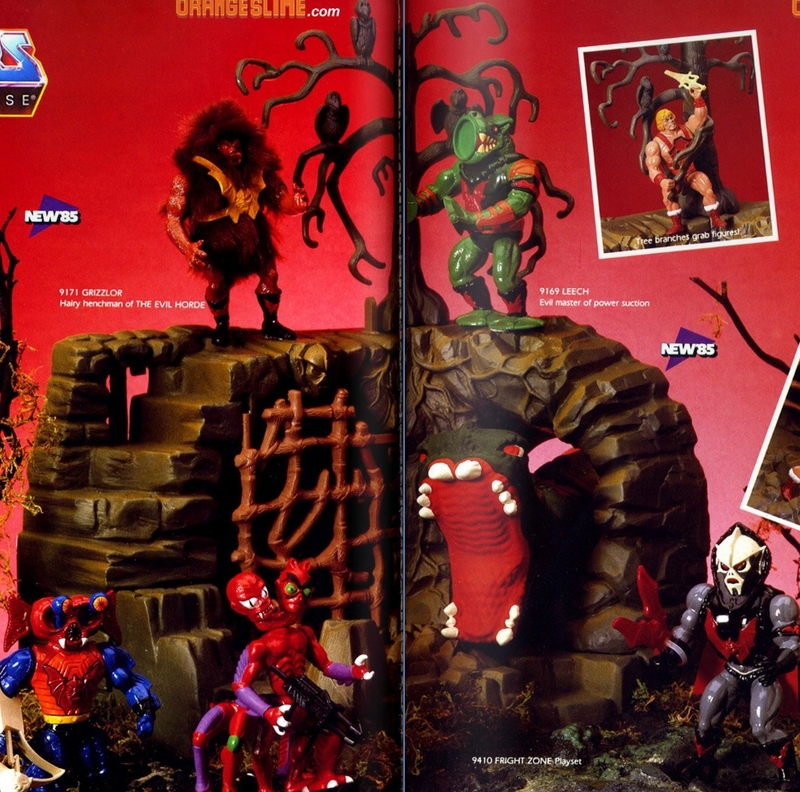 In the Filmation-produced MOTU toy commercial, Beast Man looked very close to his action figure counterpart. 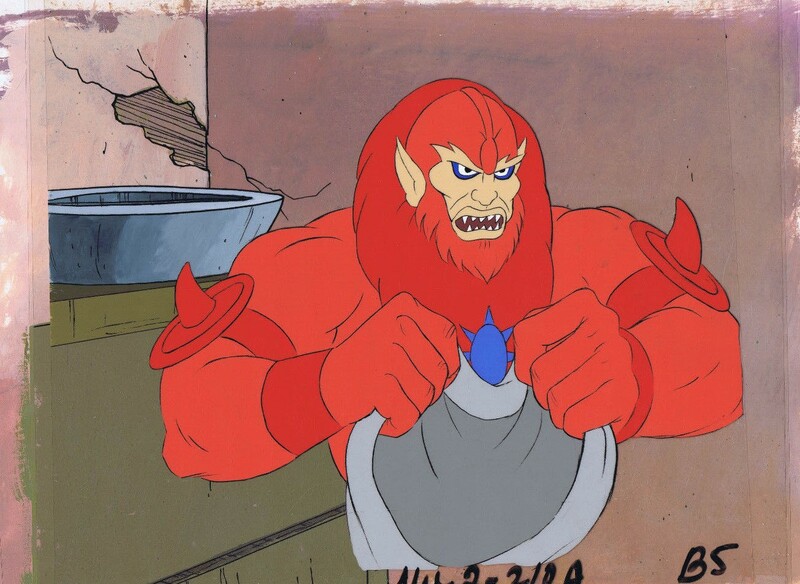 Filmation portrayed Beast Man as having the power to control some types of animals. 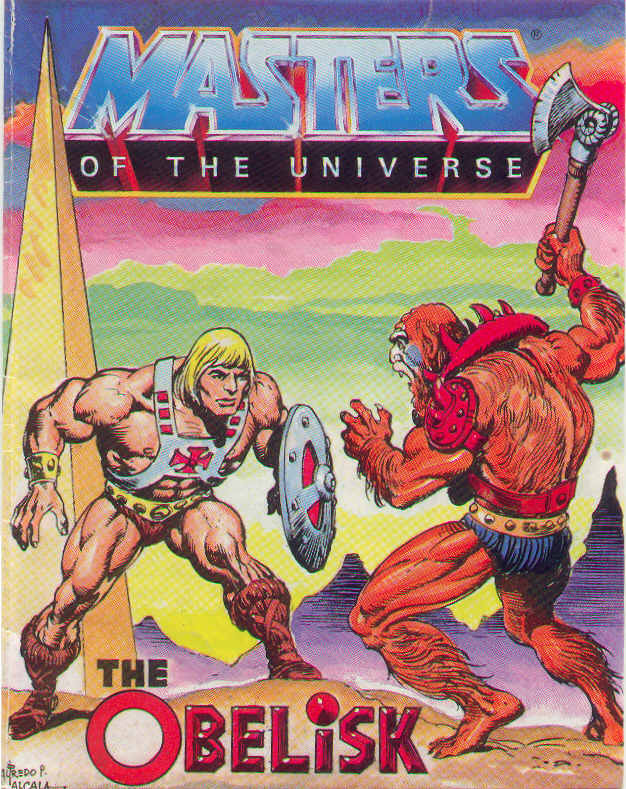 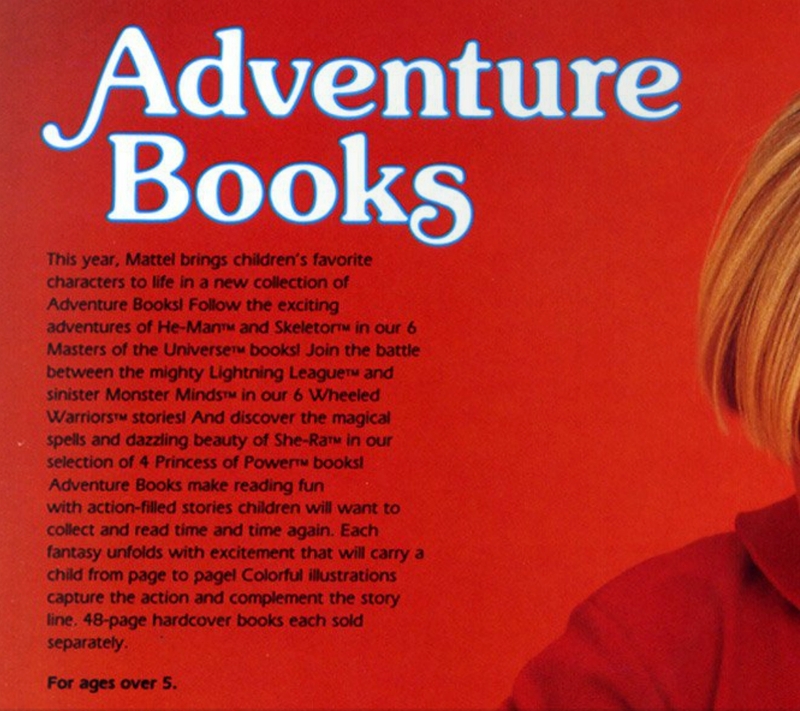 This comes from the Masters of the Universe Bible, written by Michael Halperin in December of 1982. 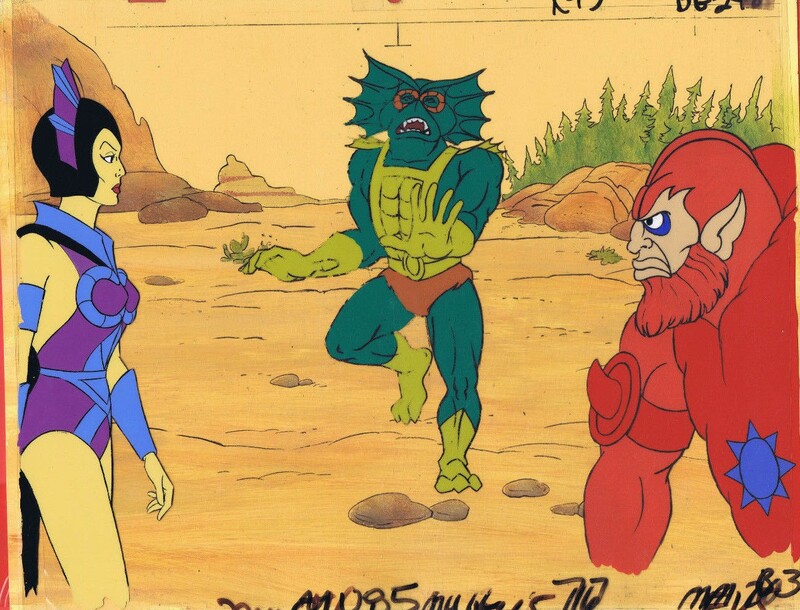 The back story where Beast Man was originally an earthling and part of Marlena’s crew of space explorers was never used. 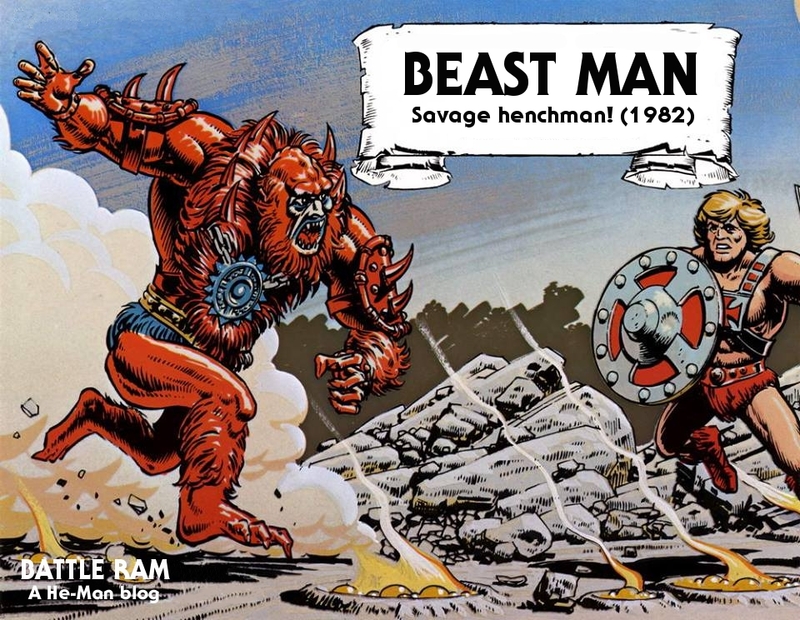 Biff Beastman’s cruel nature spilled on the outside and he became a true BEAST MAN with a lion’s mane, fangs and the power to communicate and command bloodthirsty creatures such as dragons, gorgons, ogres and snakes. 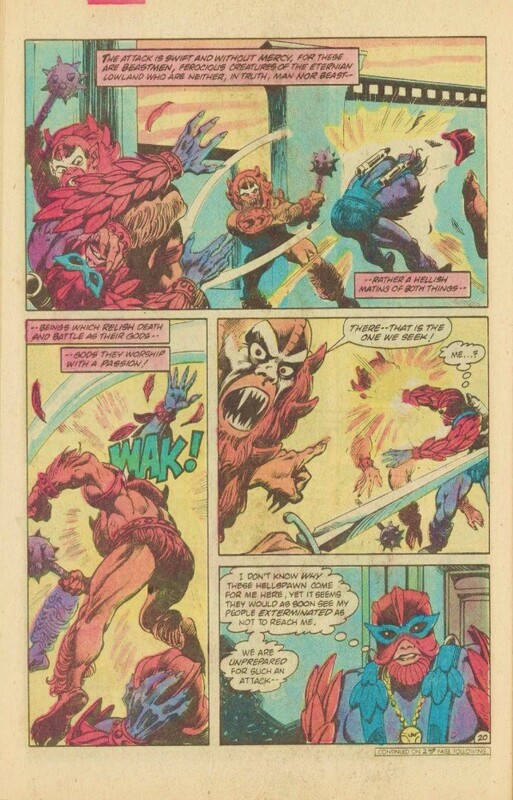 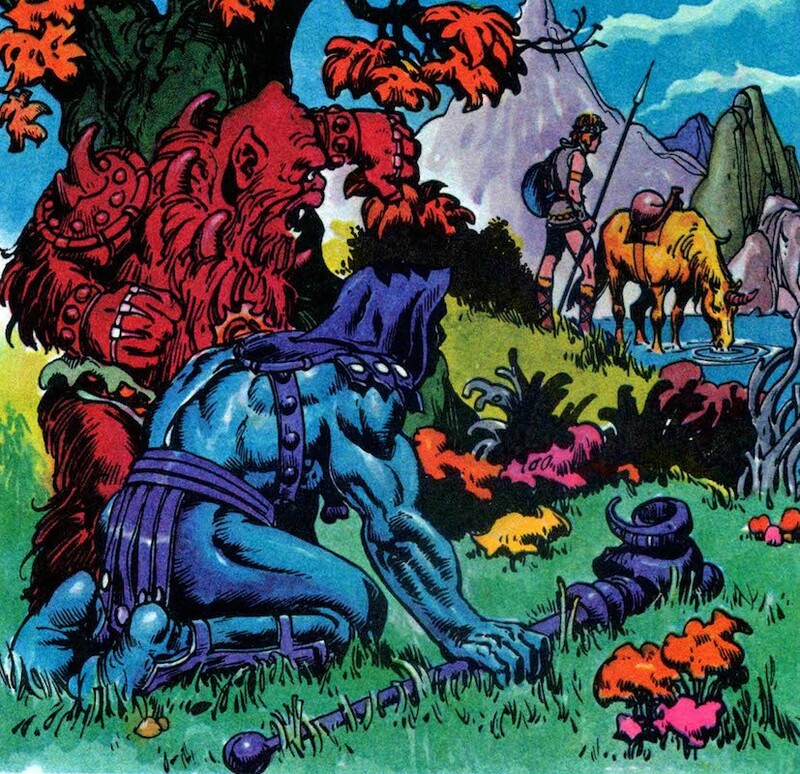 In the DC Comics-produced “To Tempt The Gods”, readers were treated to a whole race of beast men. 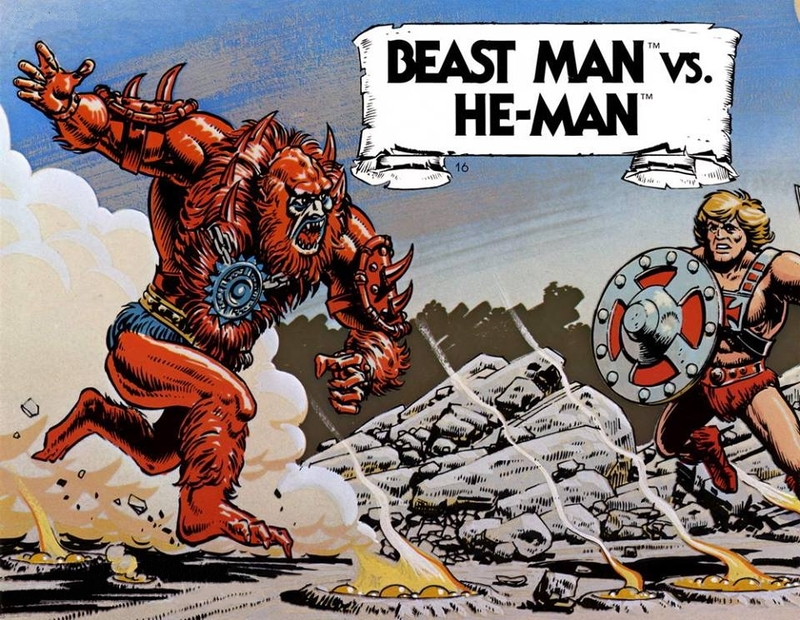 In most mini comic and Golden Books depictions, however, Beast Man was kind of a standard issue henchman character, something of an Igor to Skeletor’s Doctor Frankenstein, portrayed with varying degrees of intelligence.